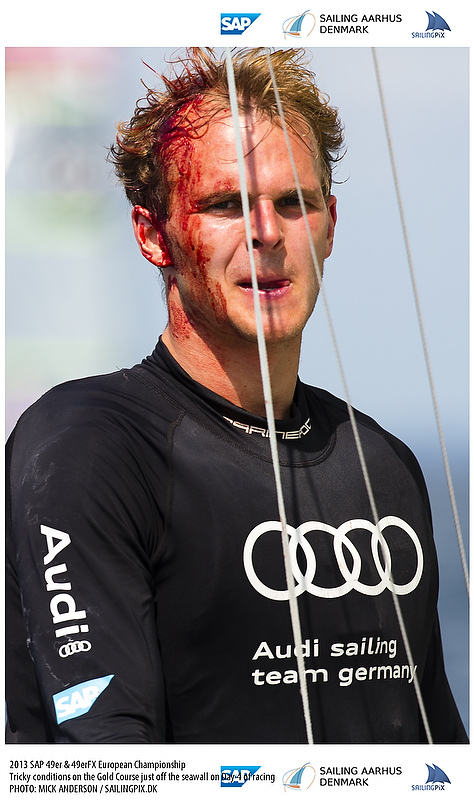 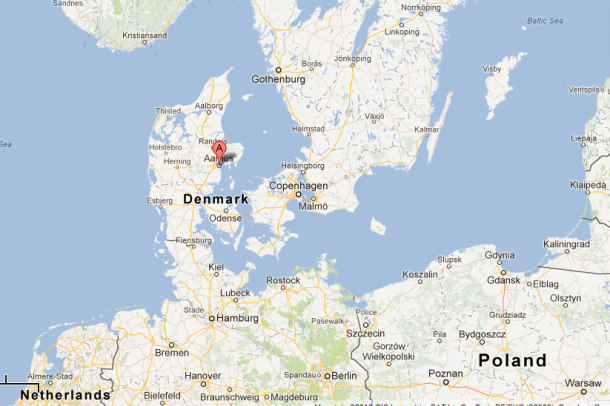 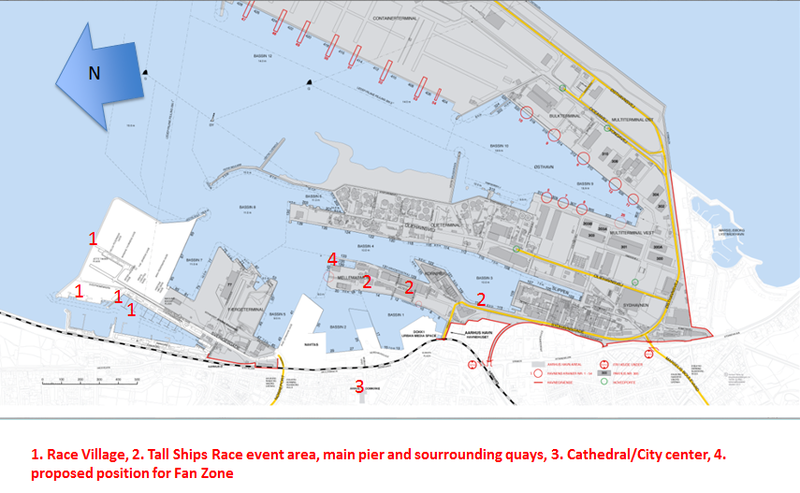 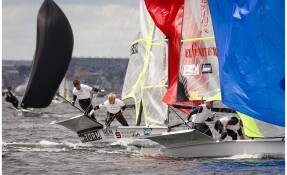 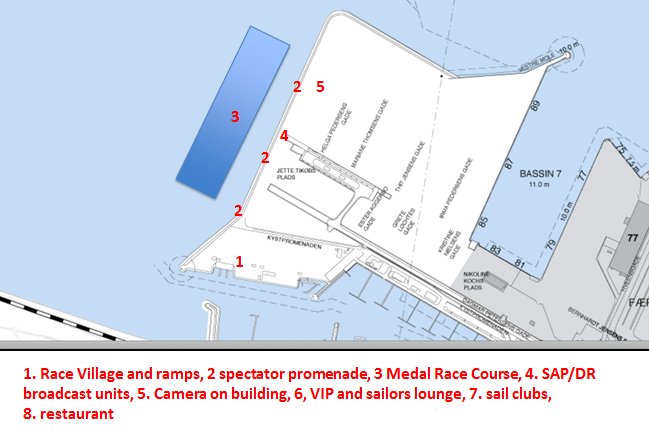 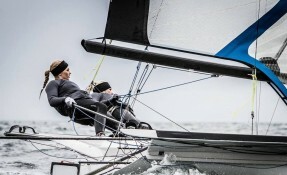 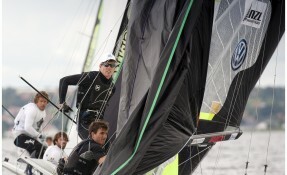 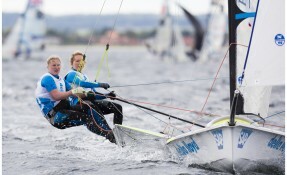 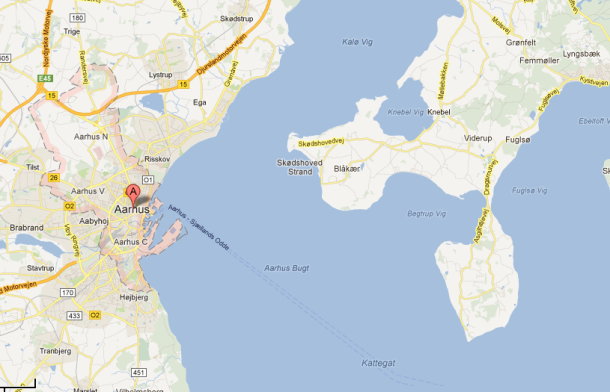 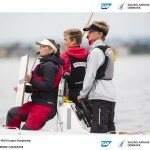 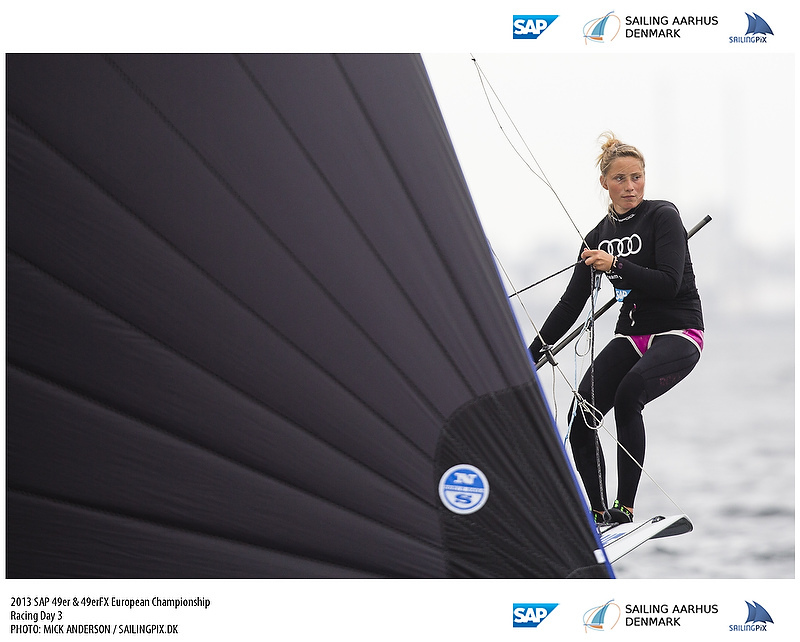 The breeze increased on race day 4 at the SAP 49er & 49erFX Europeans 2013 in Aarhus, Denmark, but continued to be shifty and rewarded the teams who could best read the track and deliver optimum boat handling. 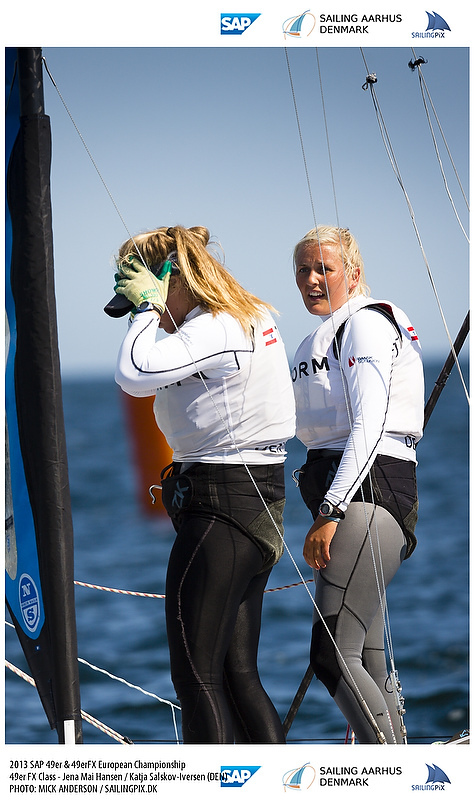 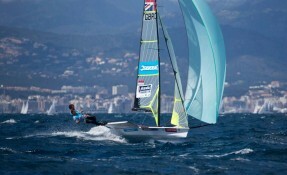 Four races today determined the top 16 teams make the cut and advance to the semi-finals at the 49er Europeans. 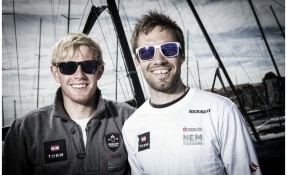 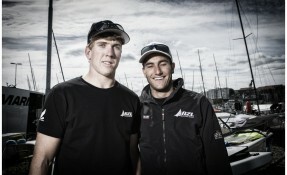 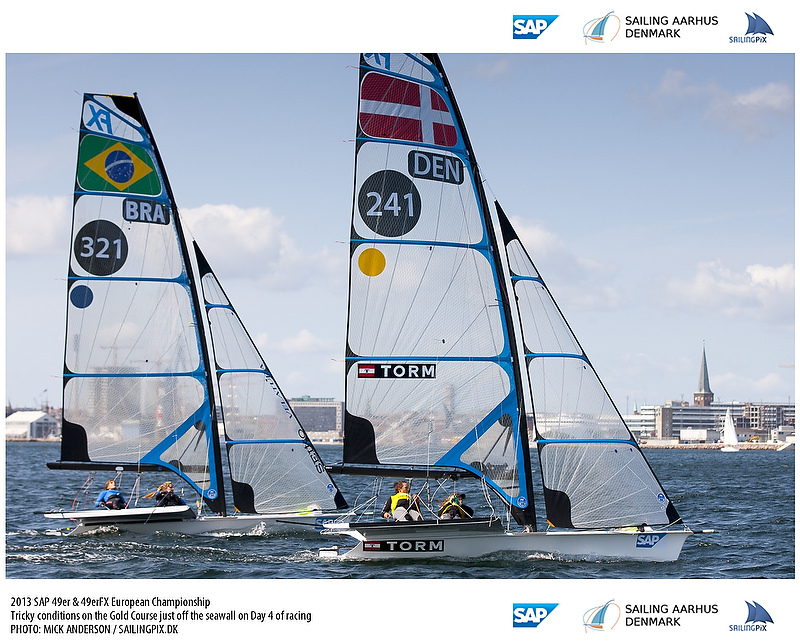 It was a thrilling day of racing in Aarhus, with the 2012 Olympic Silver medallists Peter Burling and Blair Tuke from New Zealand taking over at the front of the fleet, as they dominated the race track located right next to the shore. 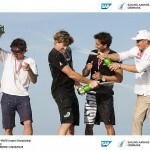 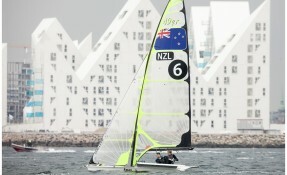 The day shaped up well for the Kiwis; in fact it could not have been any better. 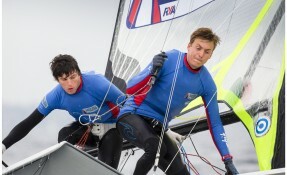 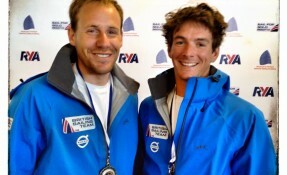 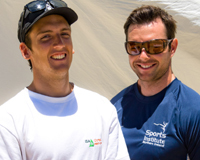 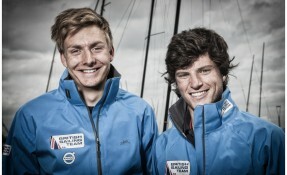 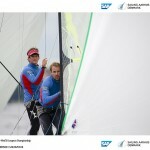 They opened their day with a second place finish, behind Great Britain’s James Peters and Ed Fitzgerald, after an incredible conversion from a 25th place rounding of the first windward mark. They upped their game even further to follow up with a race win and then round out, what may turn out to be their decisive day, with a third place and seventh, to jump into the overall lead by one point. 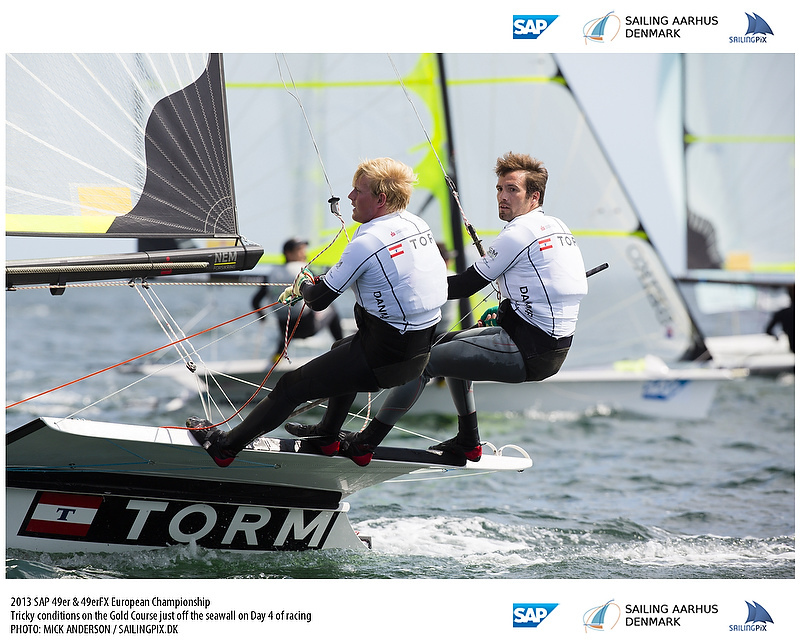 The pair are pre-Championship favourites, although in this world class fleet the outcome may still not turn out as forecast. 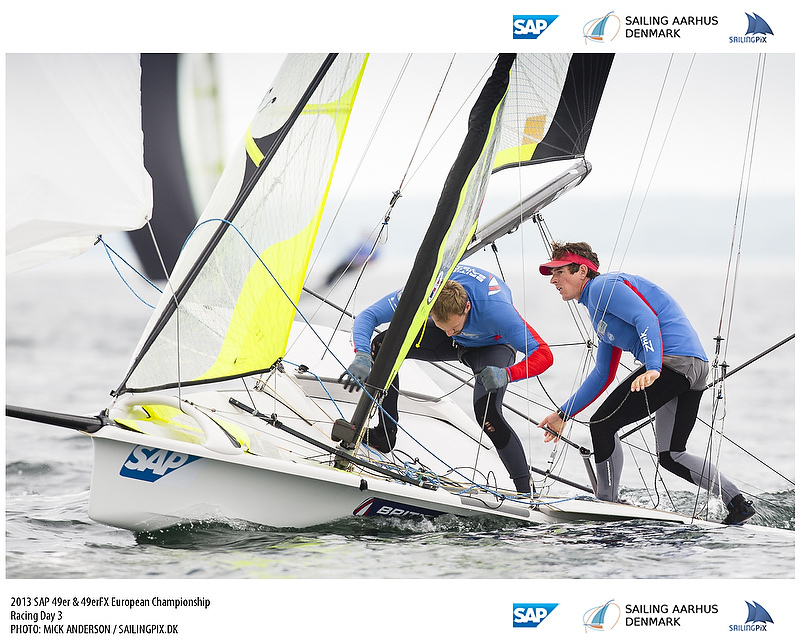 Gold fleet leaders going into the day, Dylan Fletcher and Alain Sign found themselves floundering towards the back of the fleet in the first race, finally crossing in 20th. 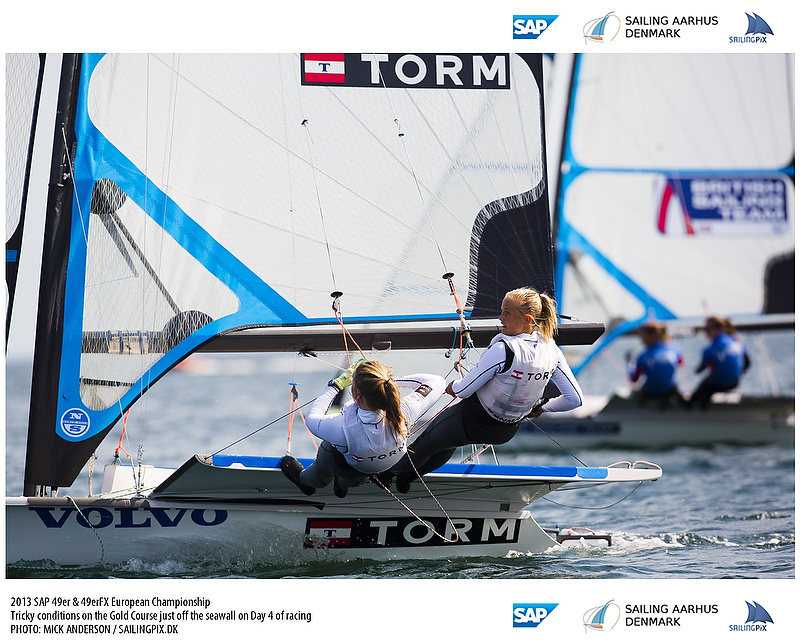 This score is discarded, but two more double digit results across the four races knocked out their points’ advantage and with it knocked them back to second. 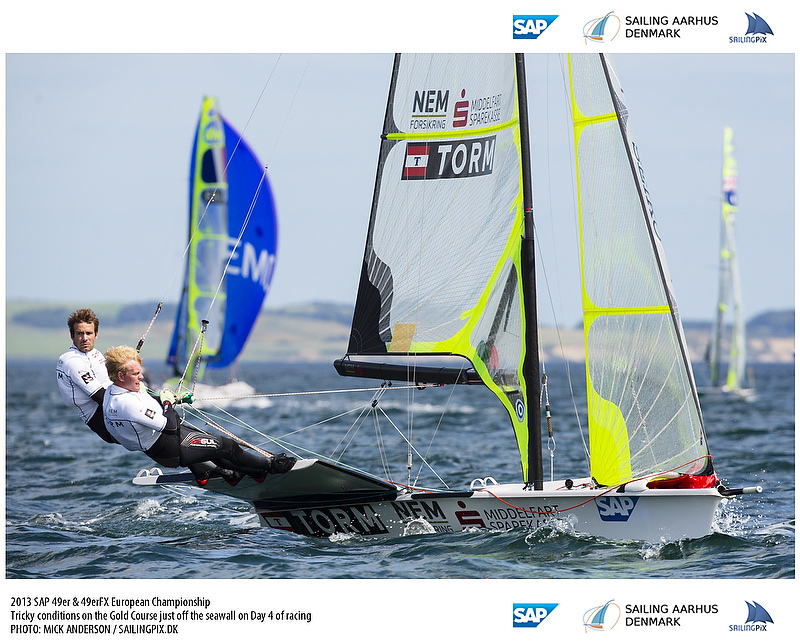 Moving on up into third are Germany’s Erik Heil and Thomas Ploessel. 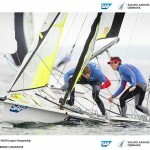 The pair had three race wins in the qualifying series, but gold fleet racing is a different online casino game, particularly in the challenging course close to shore. 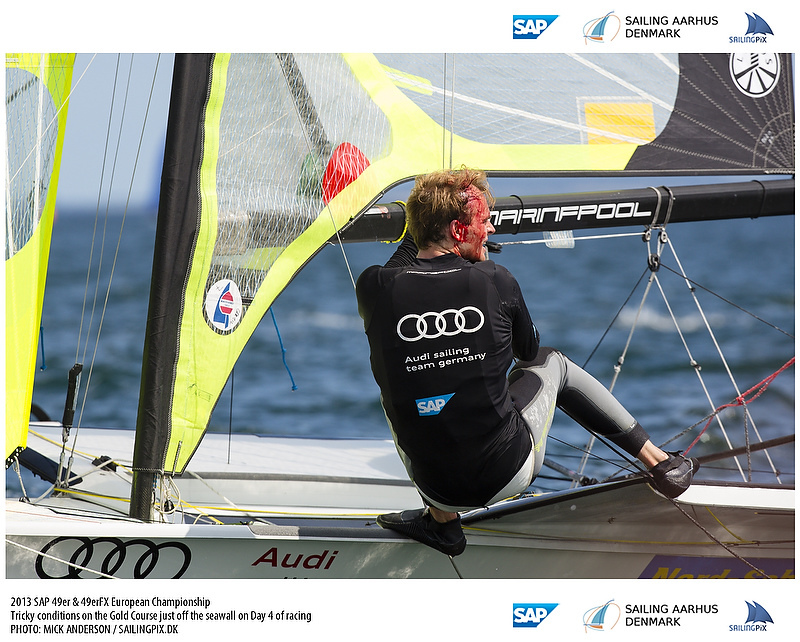 Skipper Heil has his eyes firmly on the teams just a few points behind them. 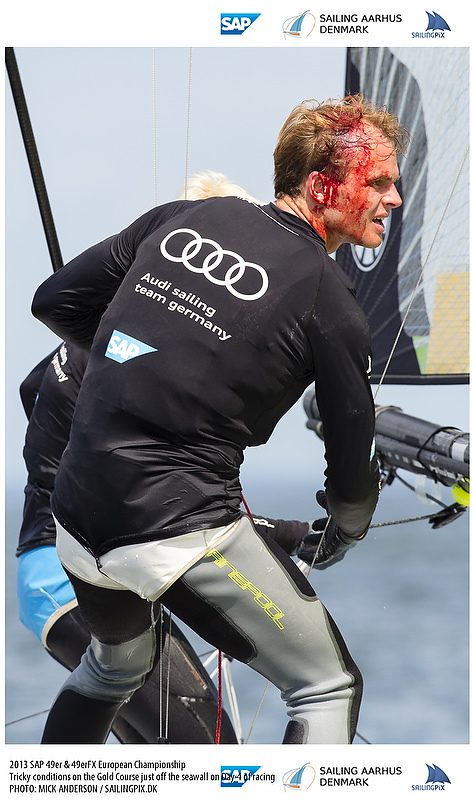 “We have a very close gap to the teams behind us so there will be top racing over the next days, and we have to take care of them,” he smiled. 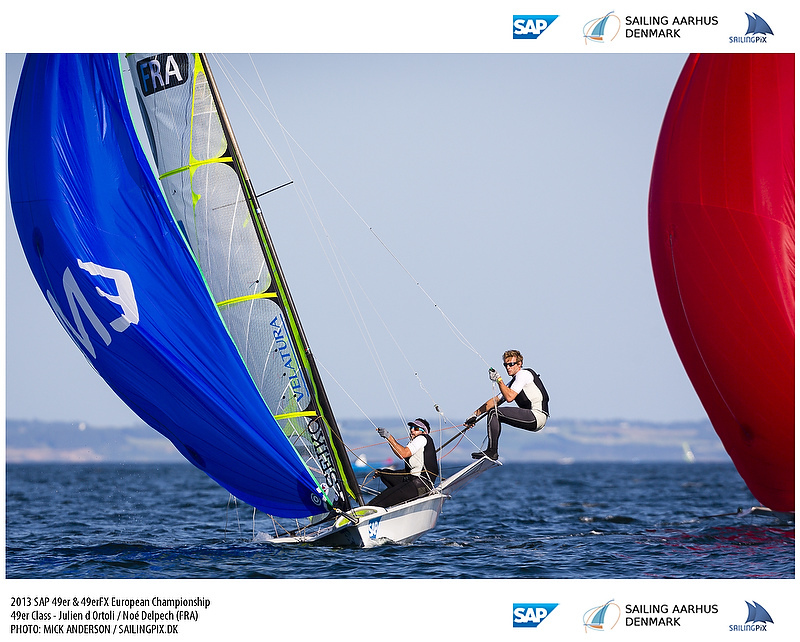 Another tough day for the defending European Champions Mathieu Frei and Yann Rocherieux who qualified through to the 16 team semi-finals in 15th place. 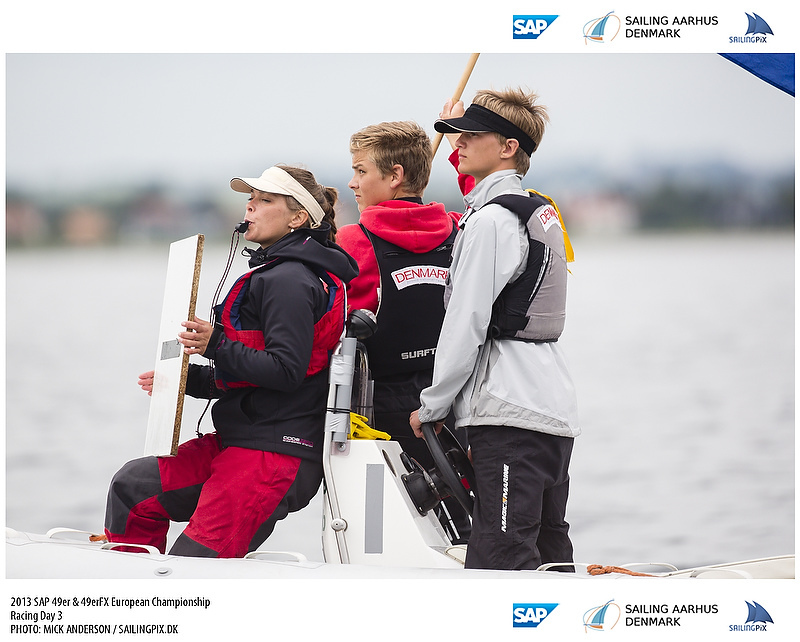 A tiebreak determined the final top 16 cut, with the 16th, 17th, 18th and 19th placed teams all on equal points. 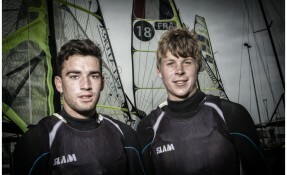 Relief for Australia’s Will Phillips and Rhys Mara who secured the tiebreak advantage and advanced through. 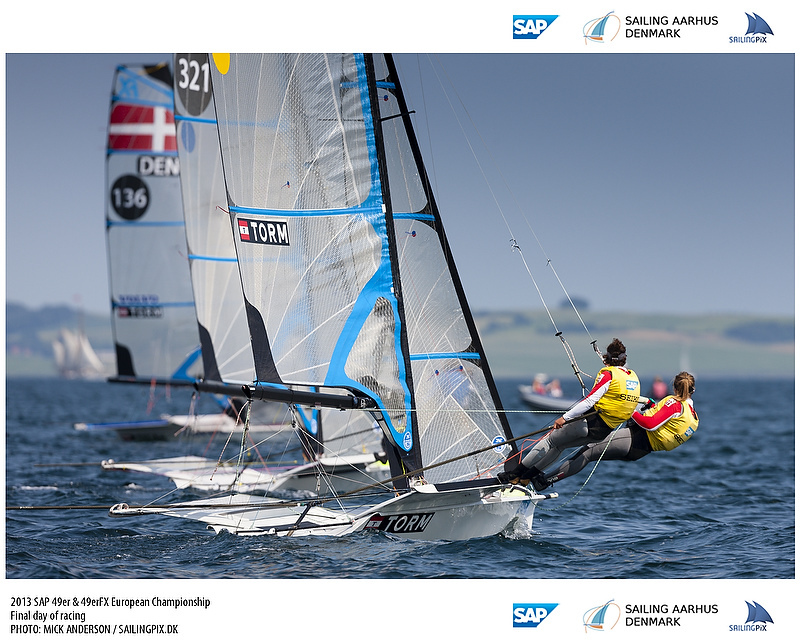 After yesterday’s racing, the thirty-seven boat 49erFX fleet were split into the top 16 Gold Fleet with the remaining 21 boats racing in the Silver Fleet, for today’s first day of the Fleet Race stage. 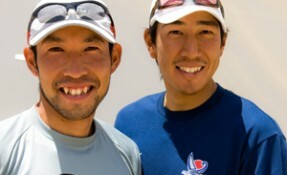 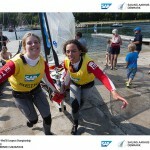 They were up on the race track close to shore first for their four races. 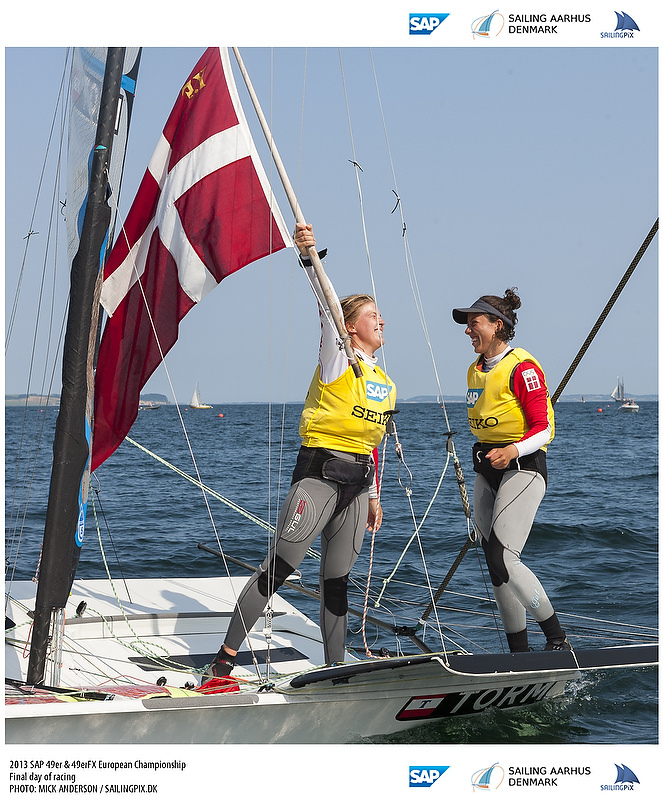 Ida Marie Baad Nielsen and Marie Thusgaard Olsen continue to fly the flag for host nation Denmark, and are joined by team mates Jena Mai Hansen and Katja Salskov-Iversen who have moved up to second overall. 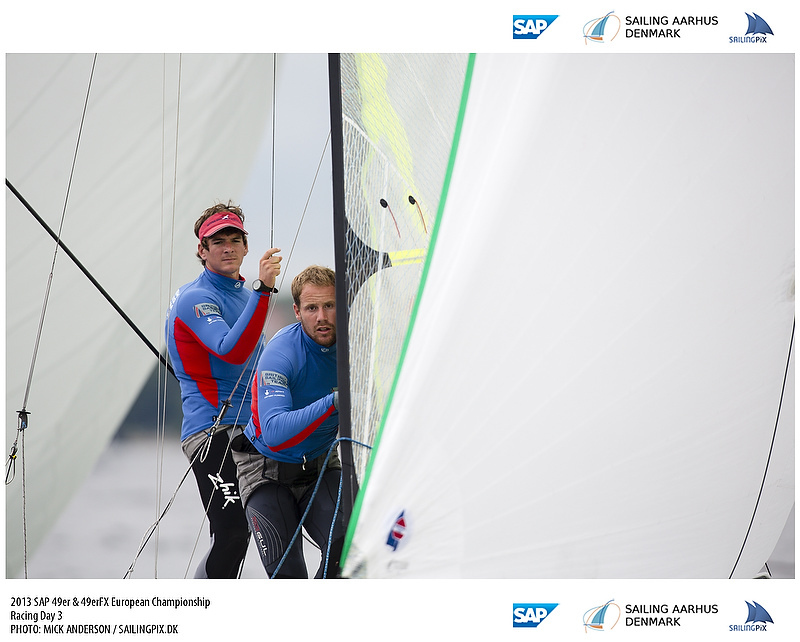 Hansen and Salskov-Iversen converted their fourth overall at the start of the day into second place by the end from a 1,3,4,8 scoreline. 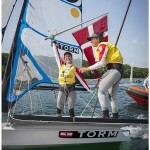 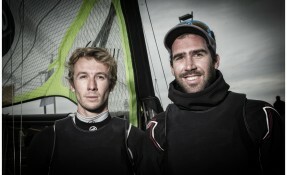 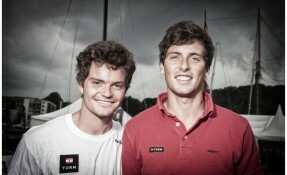 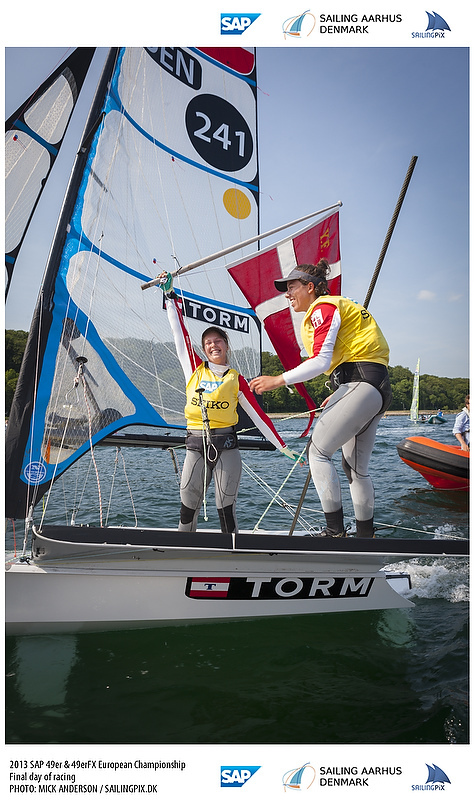 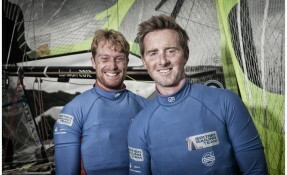 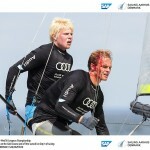 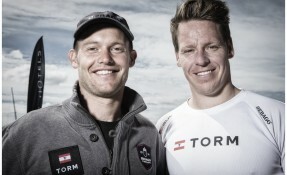 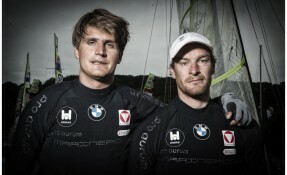 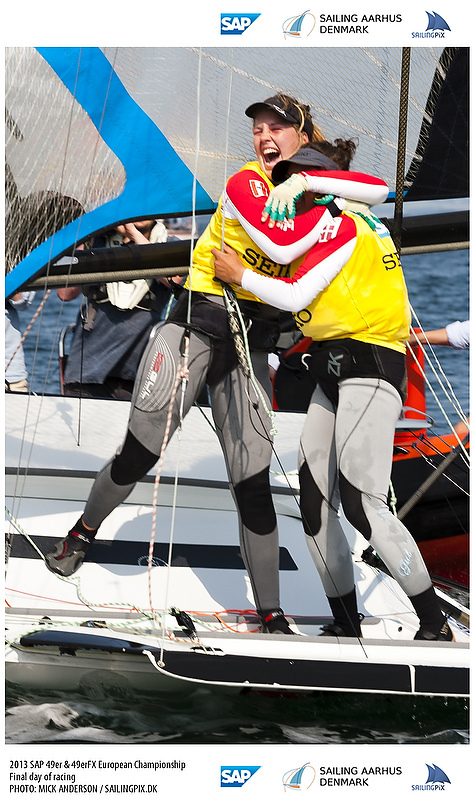 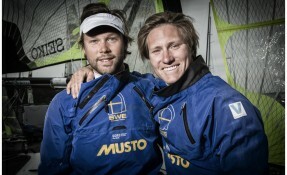 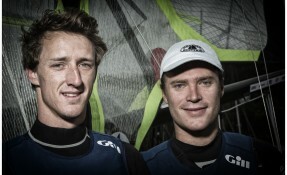 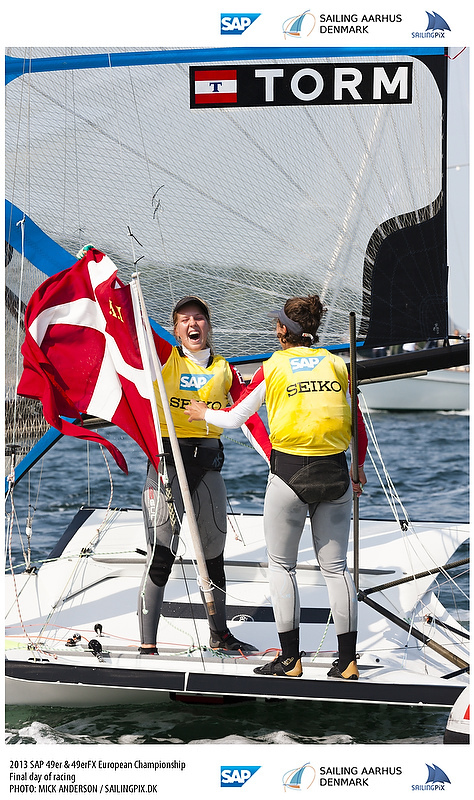 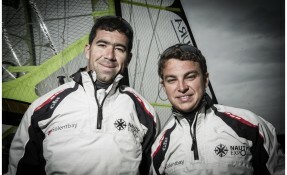 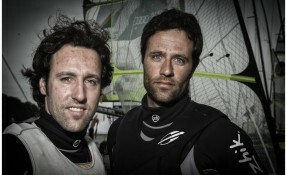 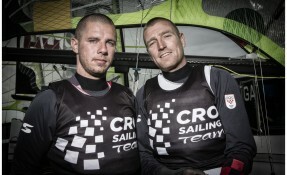 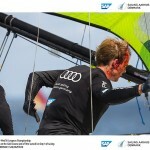 “We had to sail with what we had and forget the other boats,” Salskov-Iversen chipped in. 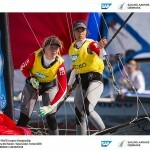 Just one point behind the Kiwis are Brazil’s Martine Grael and Kattena Kunze, with a 13 point gap to the next team of Italy’s Giulia Conti and Francesca Clapcich. 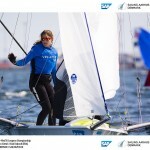 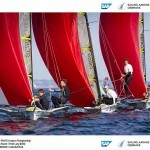 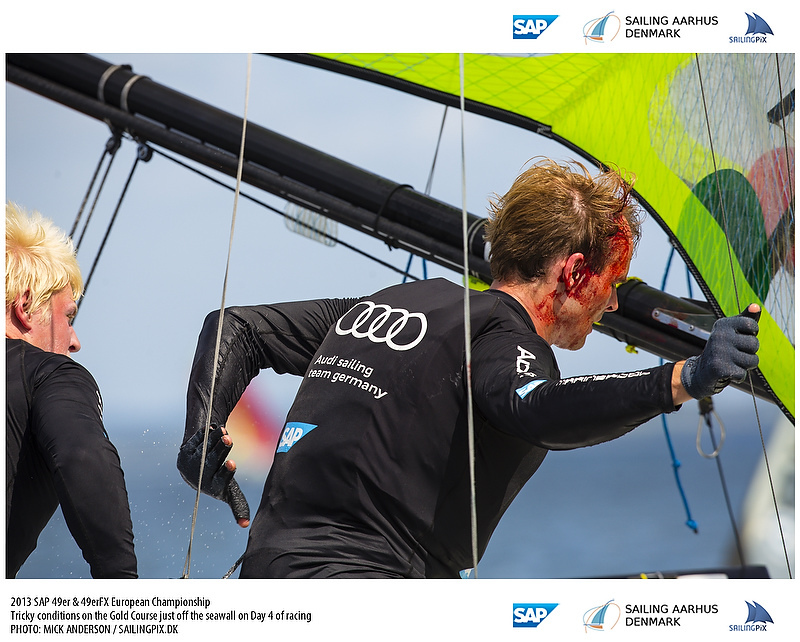 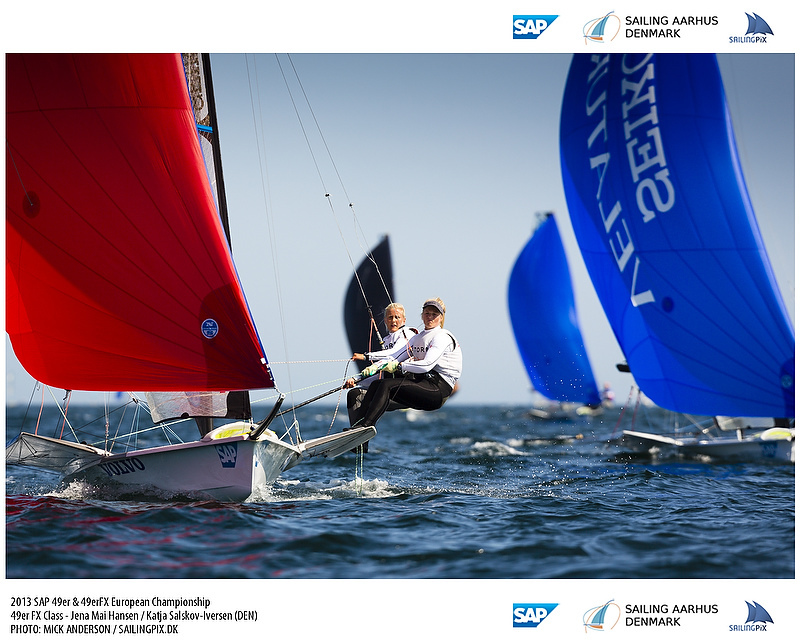 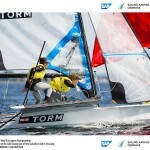 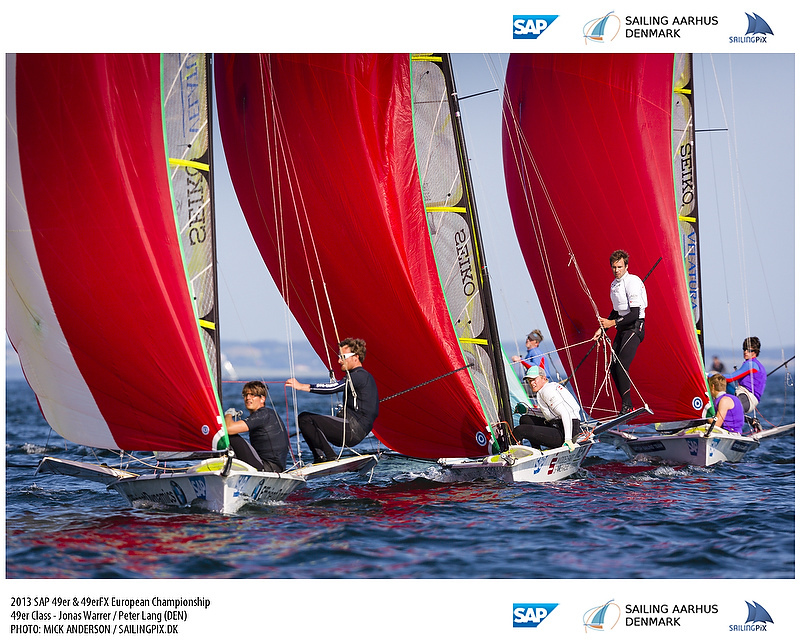 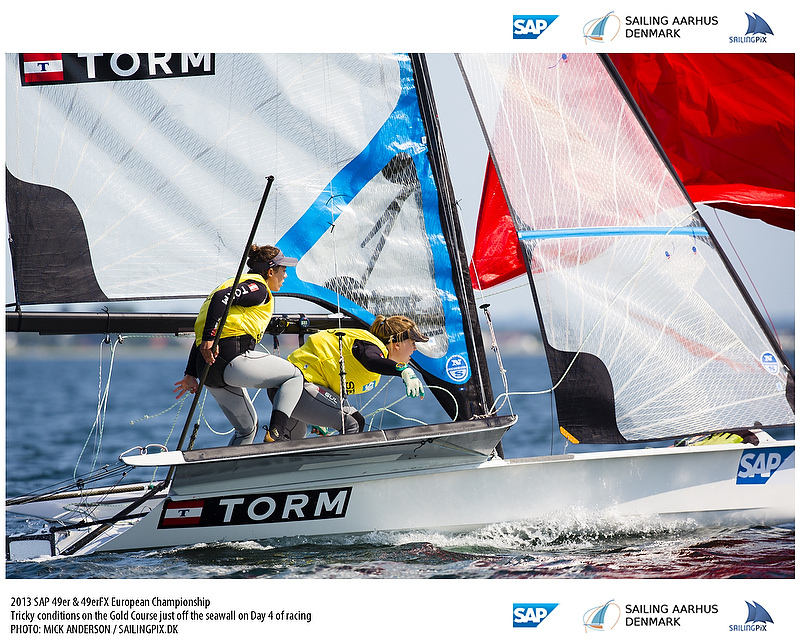 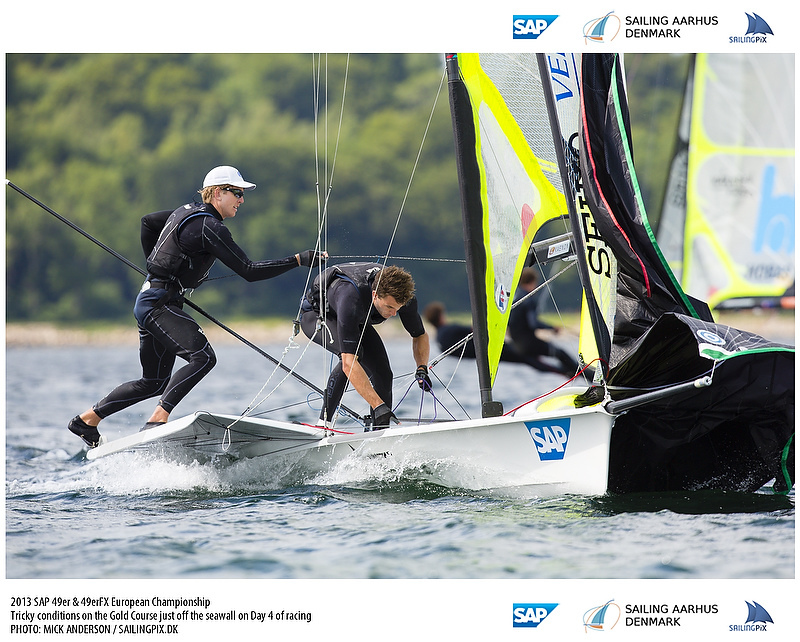 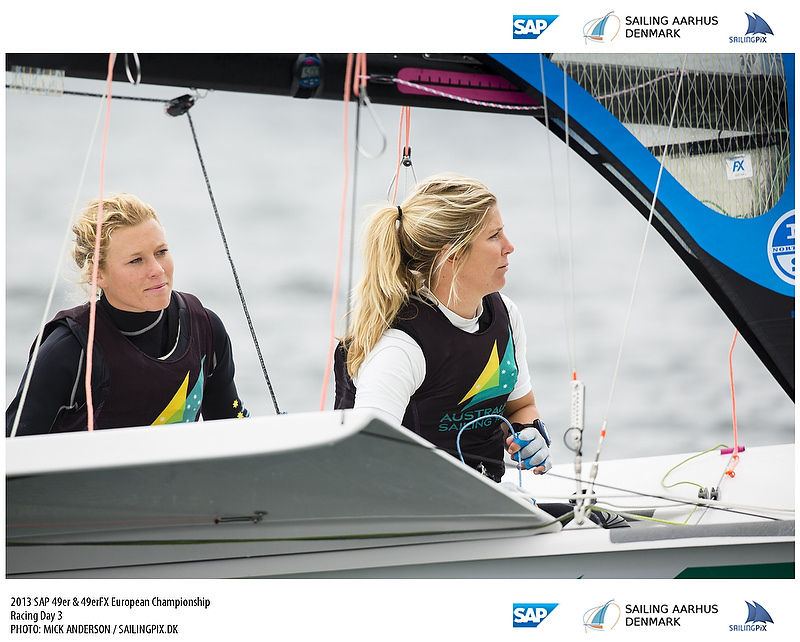 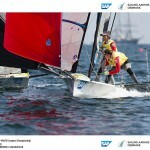 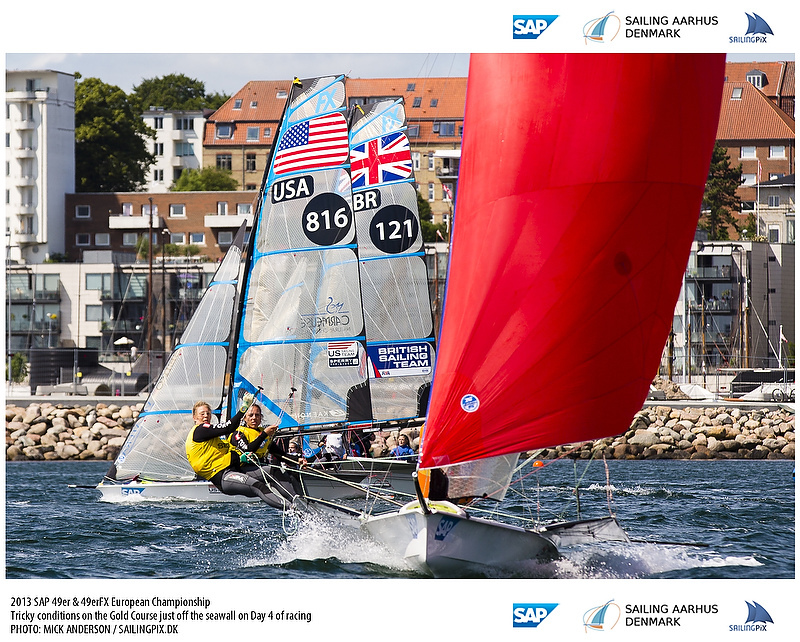 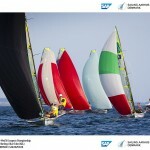 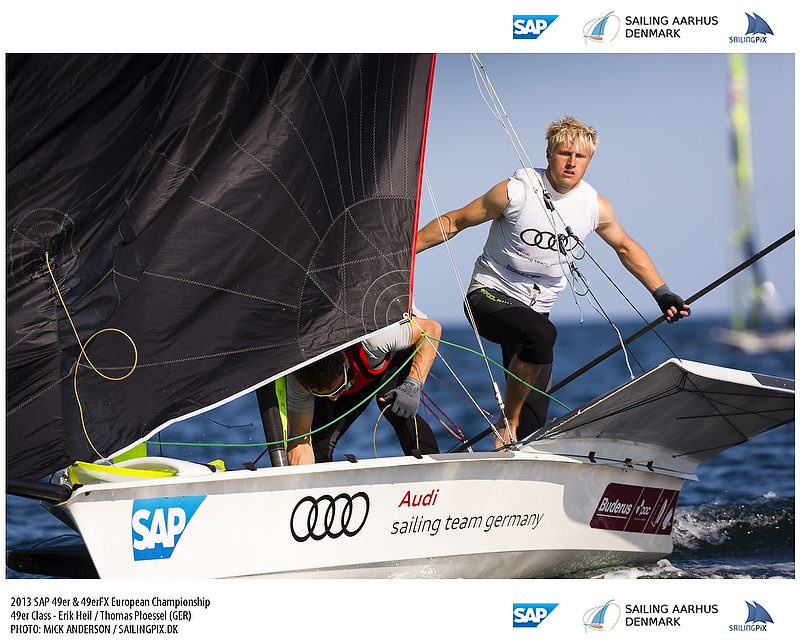 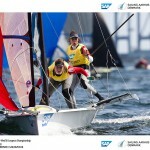 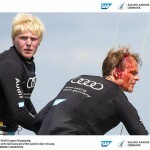 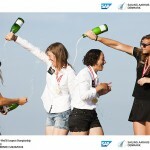 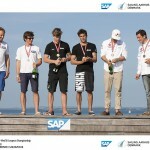 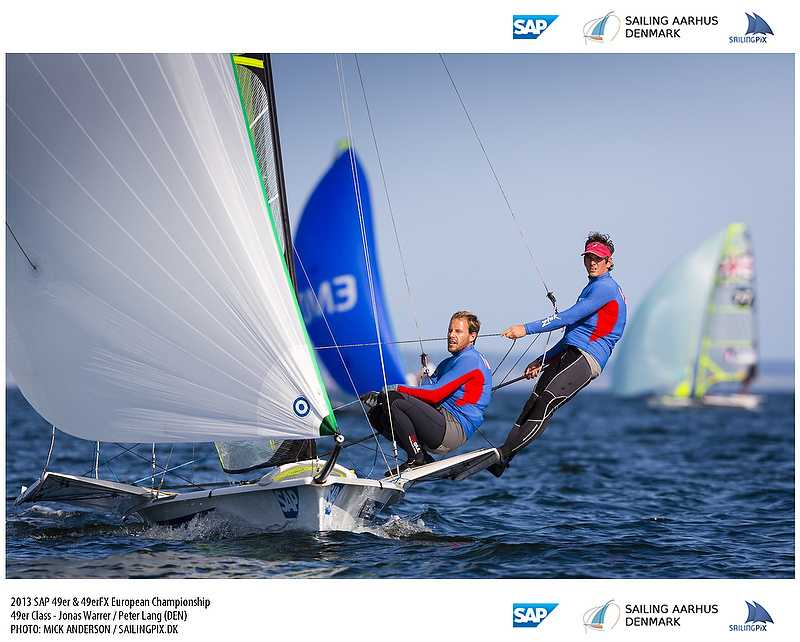 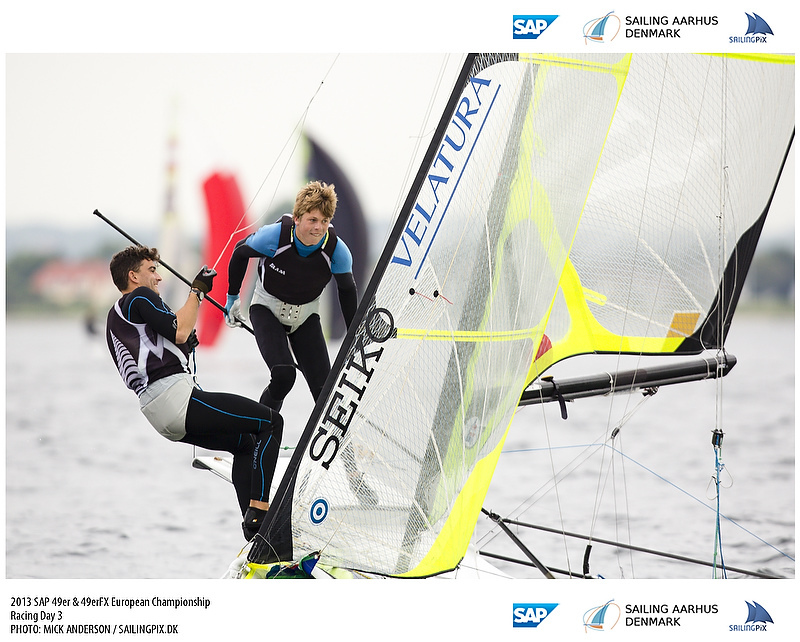 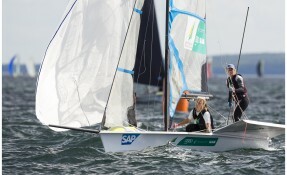 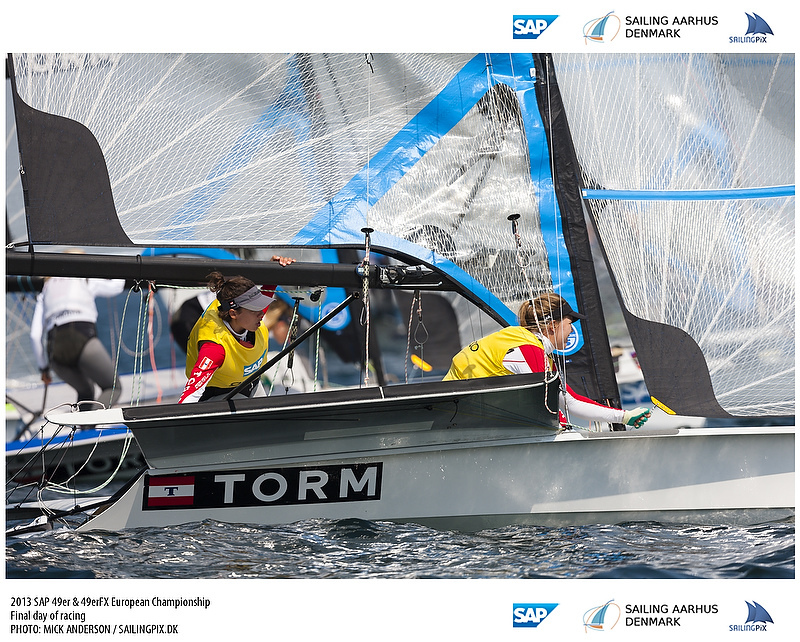 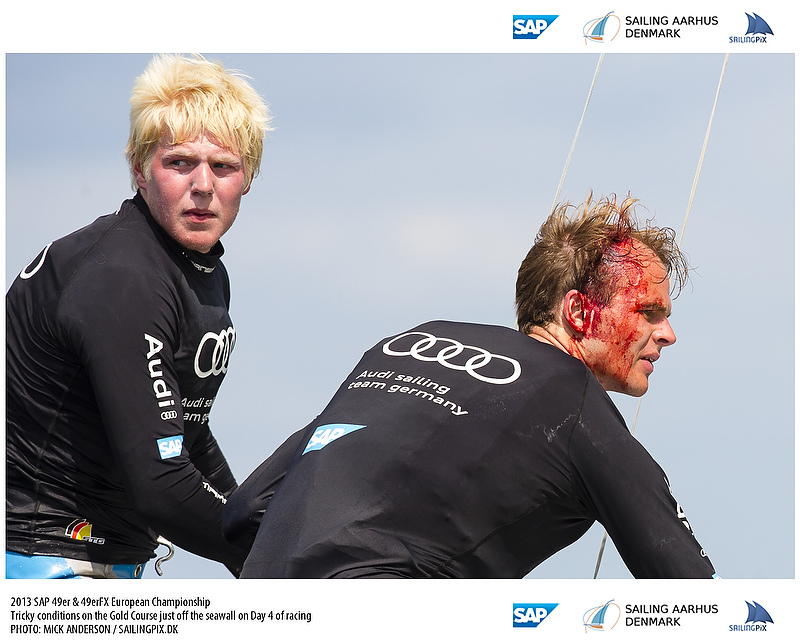 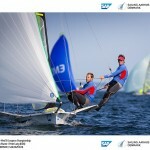 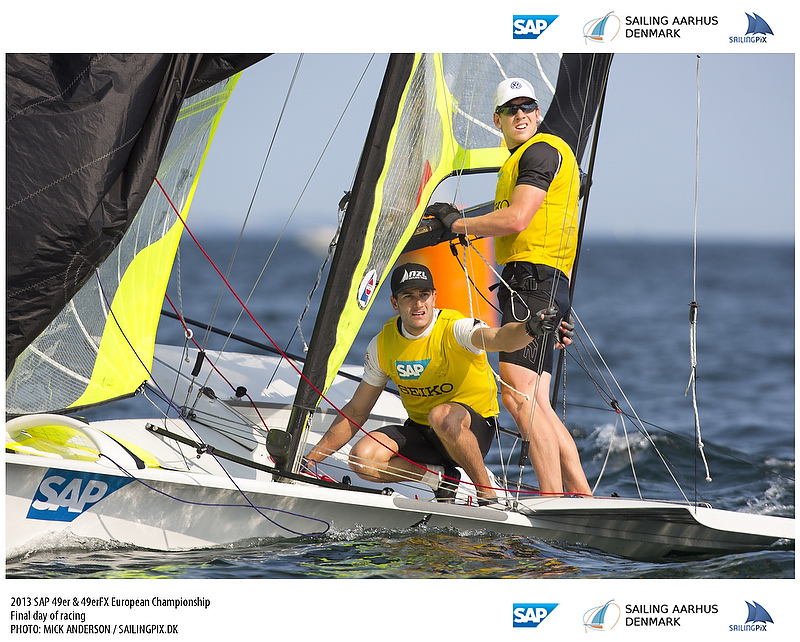 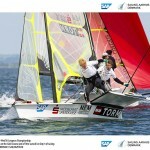 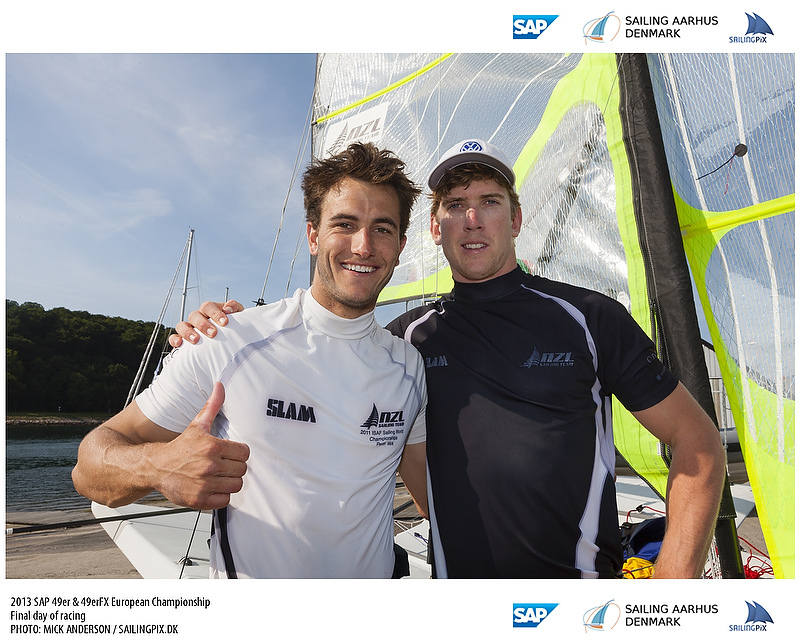 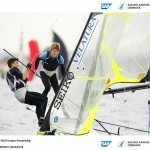 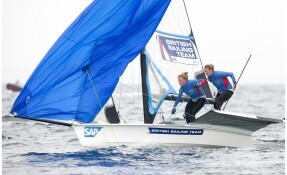 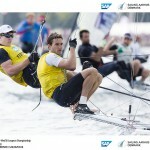 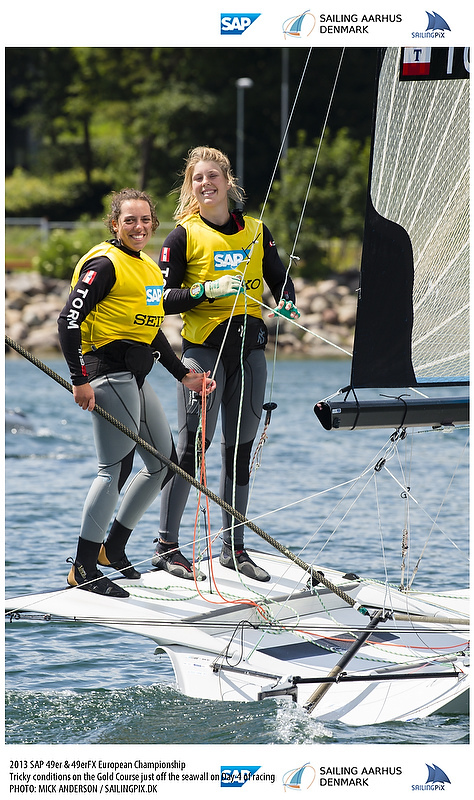 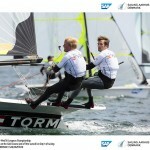 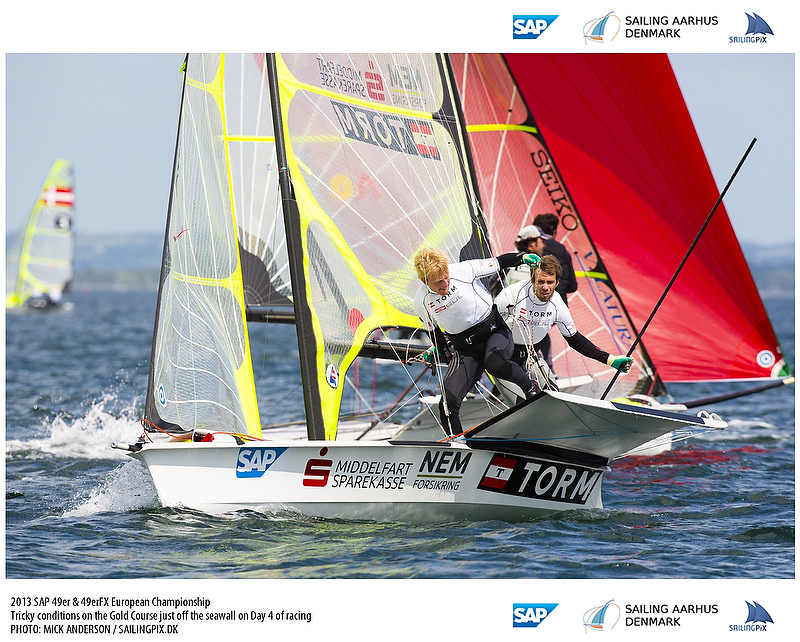 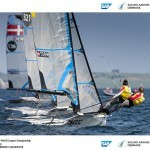 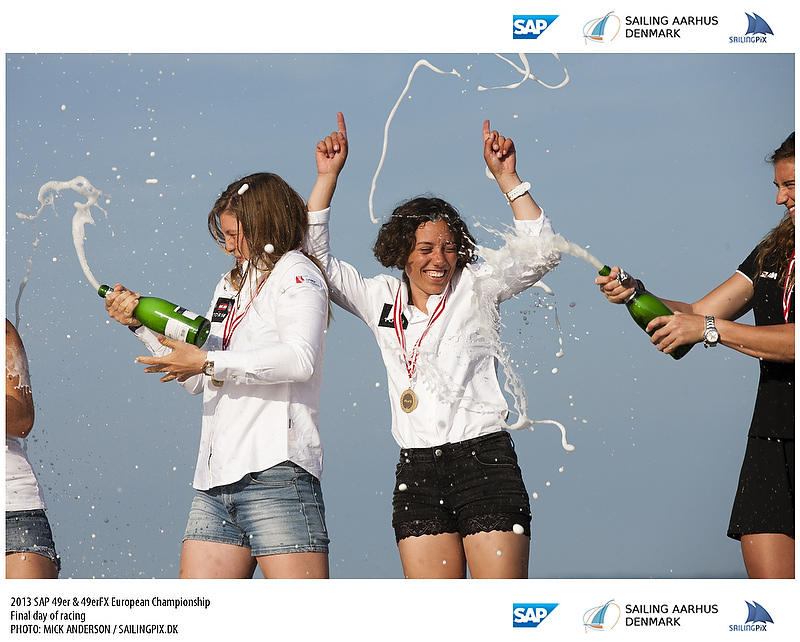 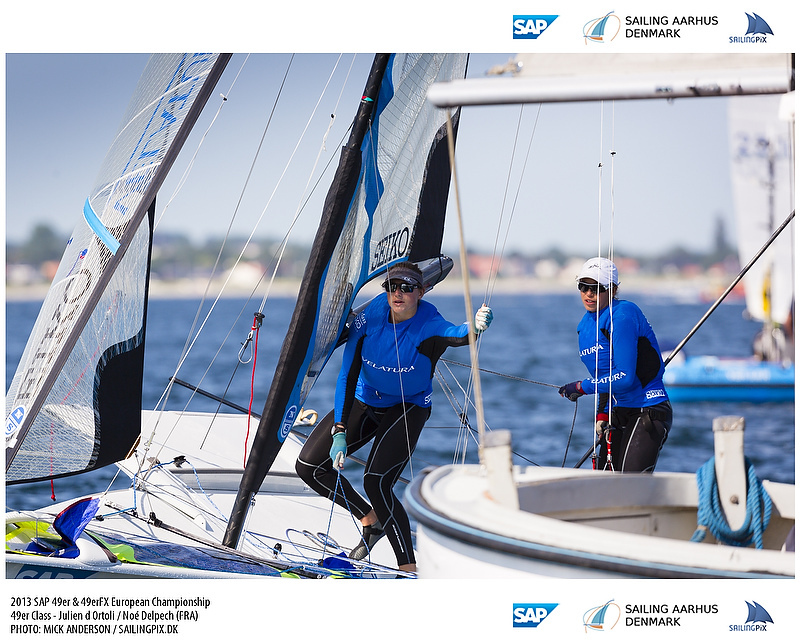 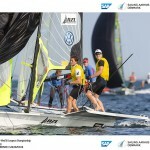 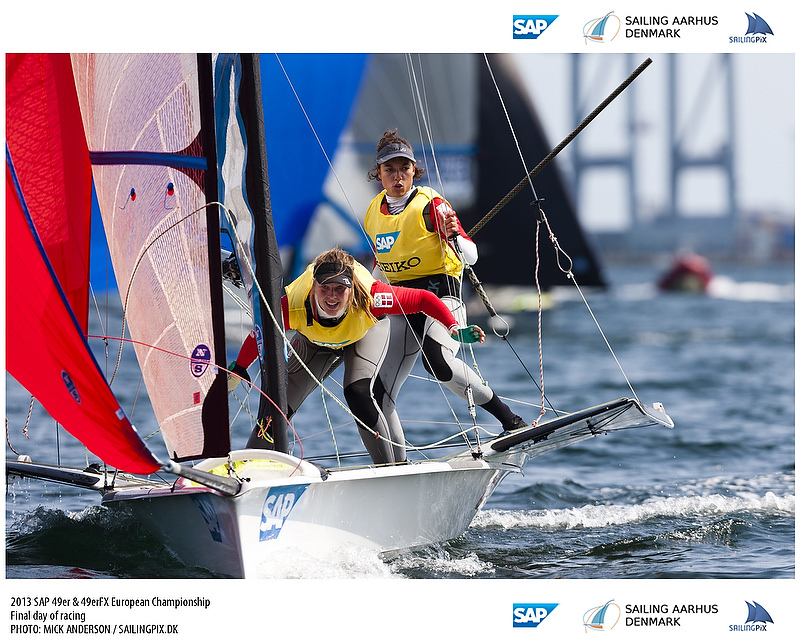 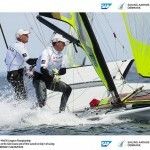 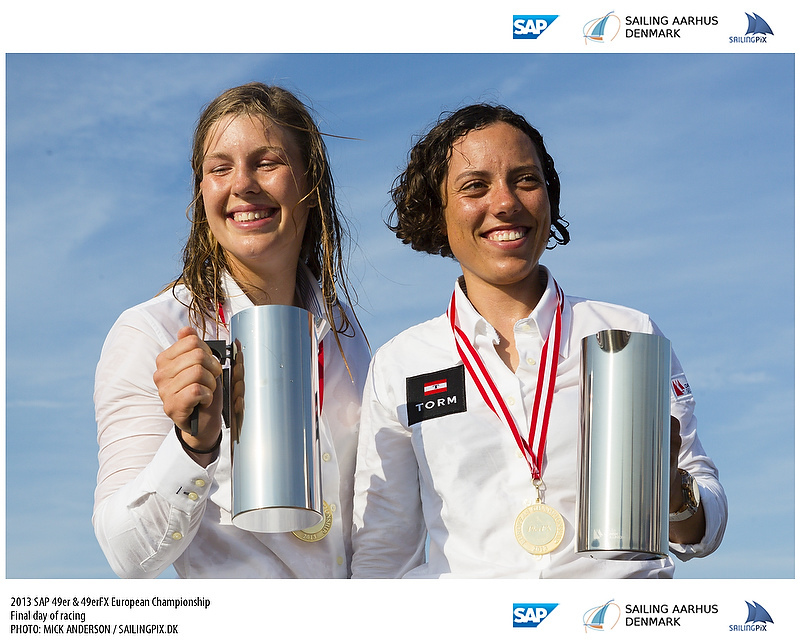 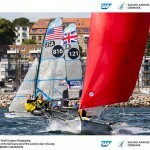 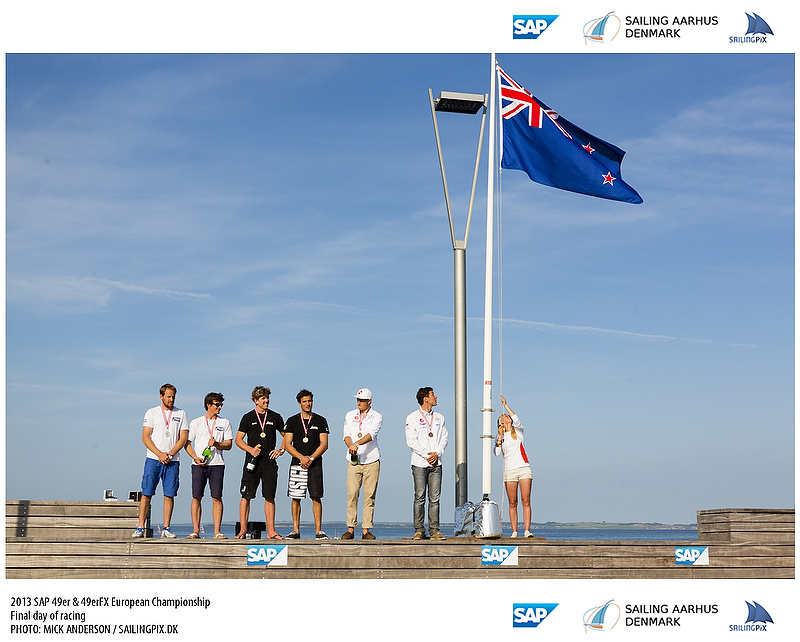 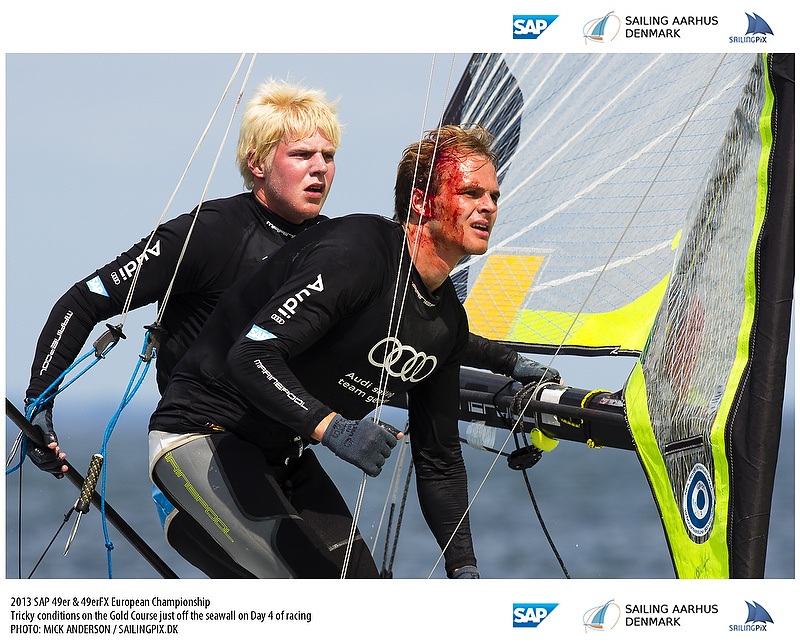 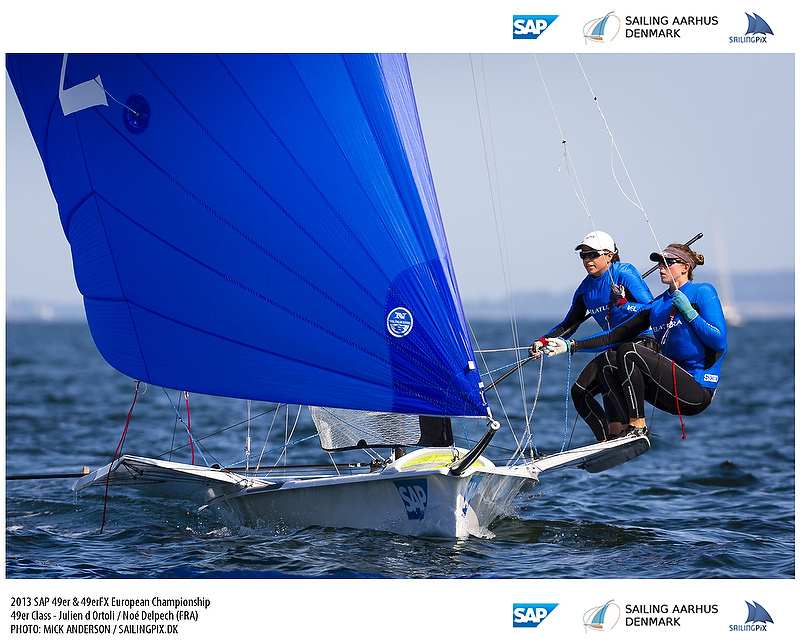 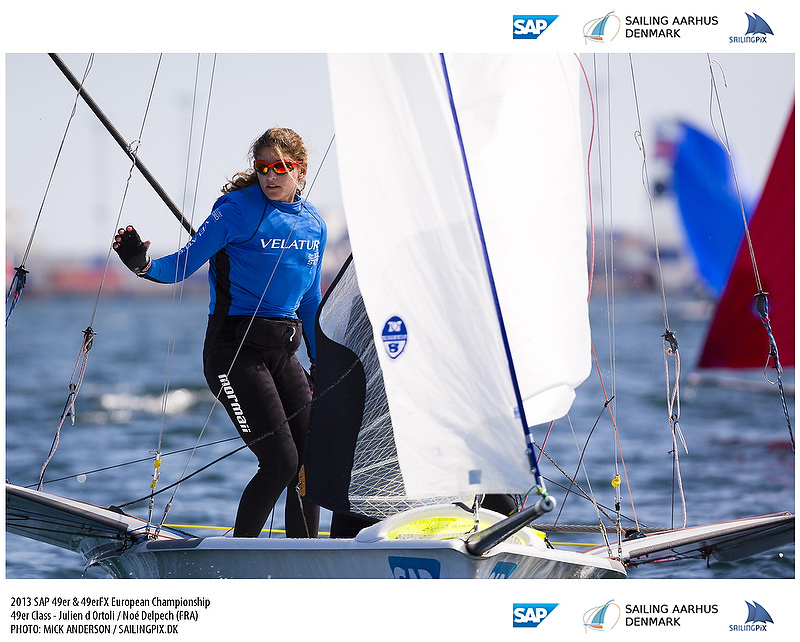 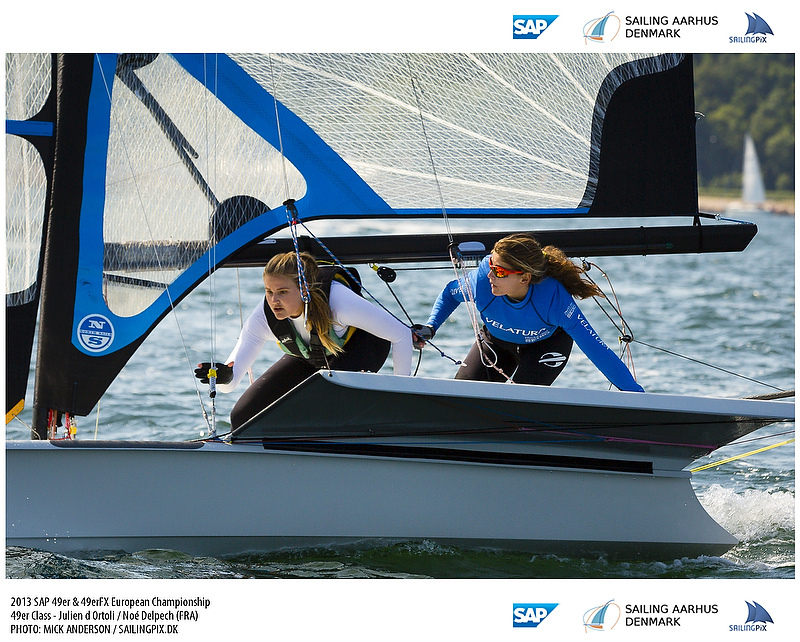 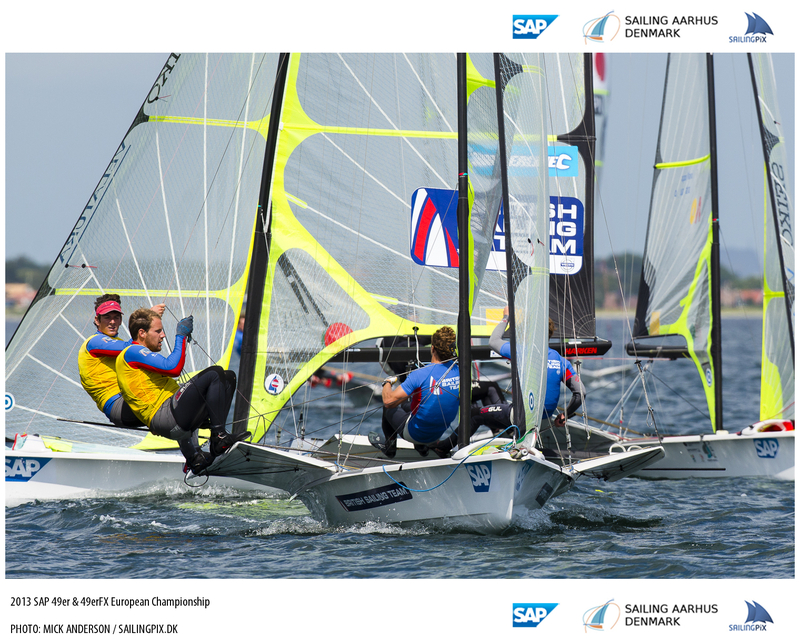 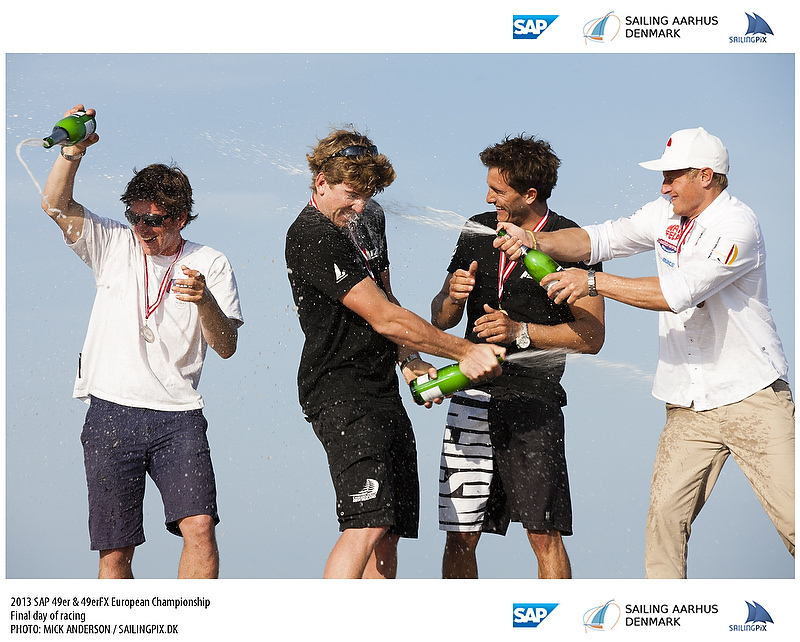 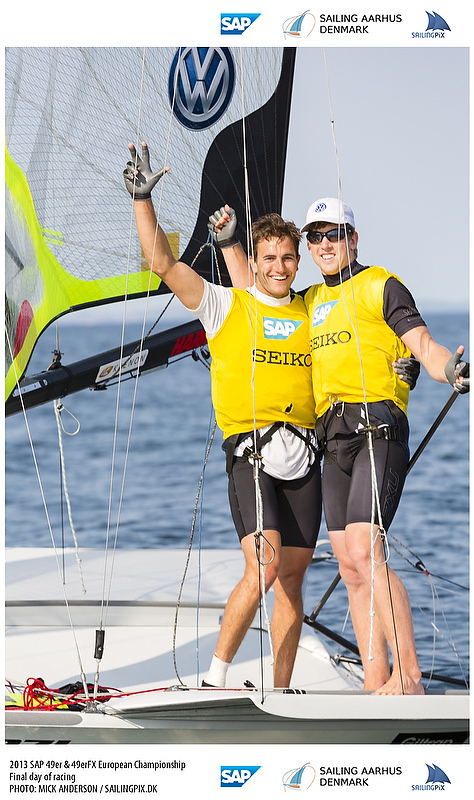 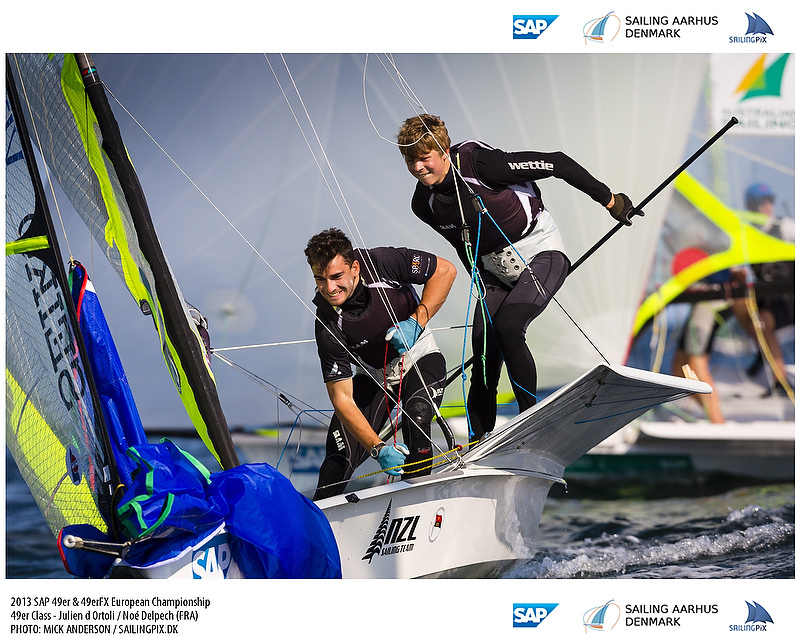 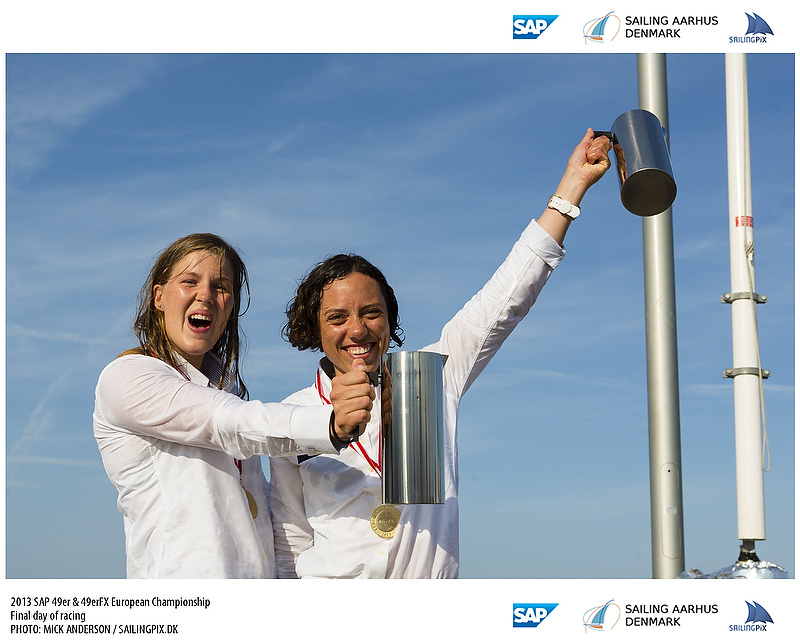 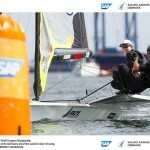 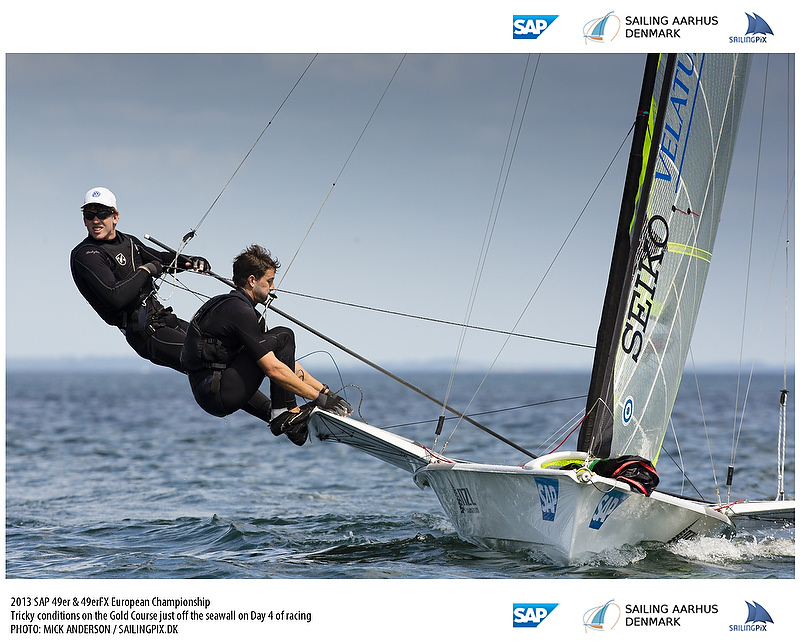 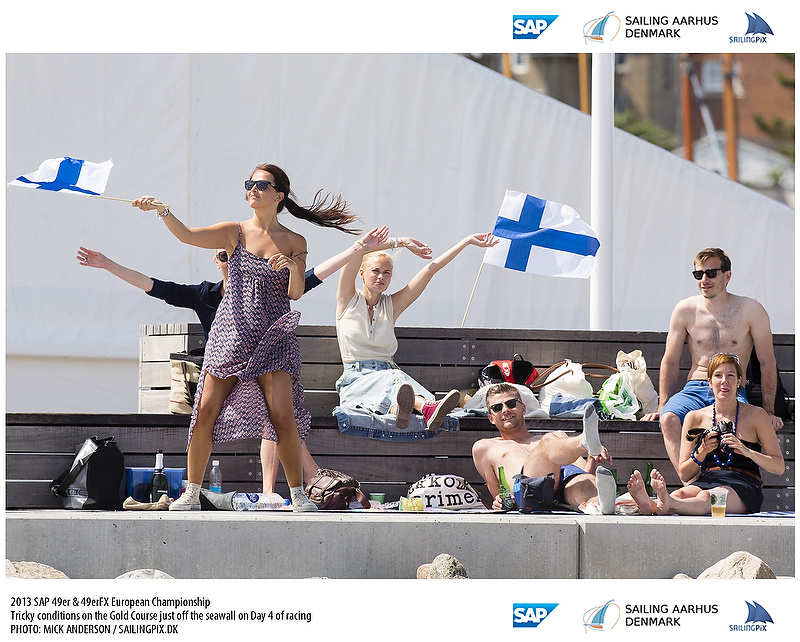 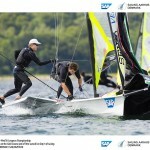 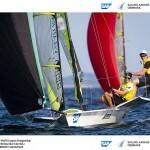 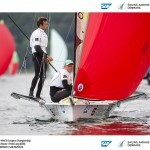 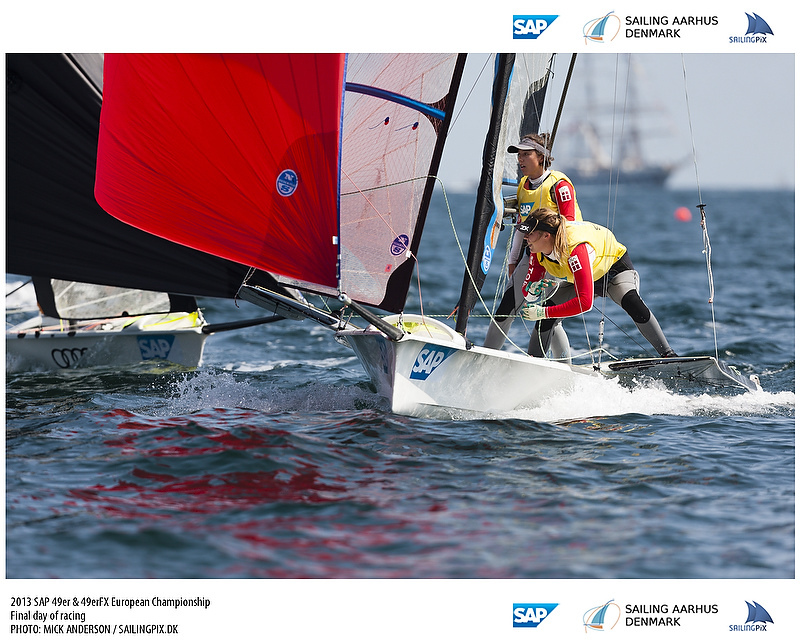 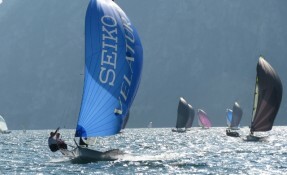 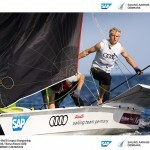 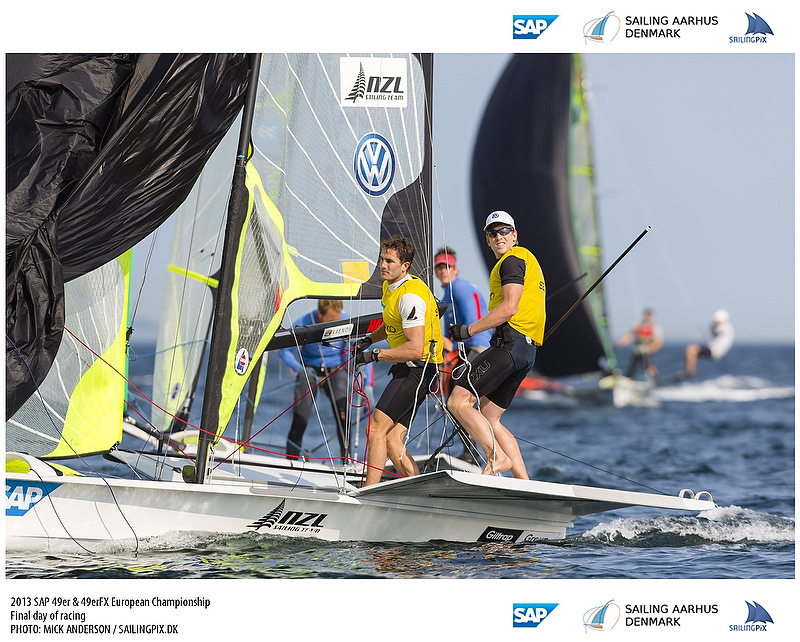 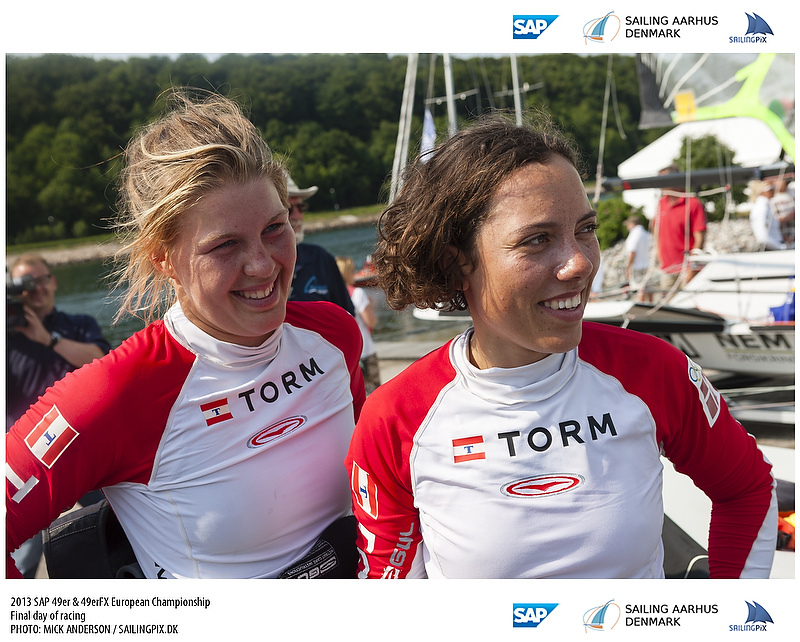 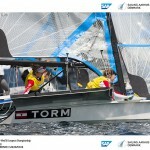 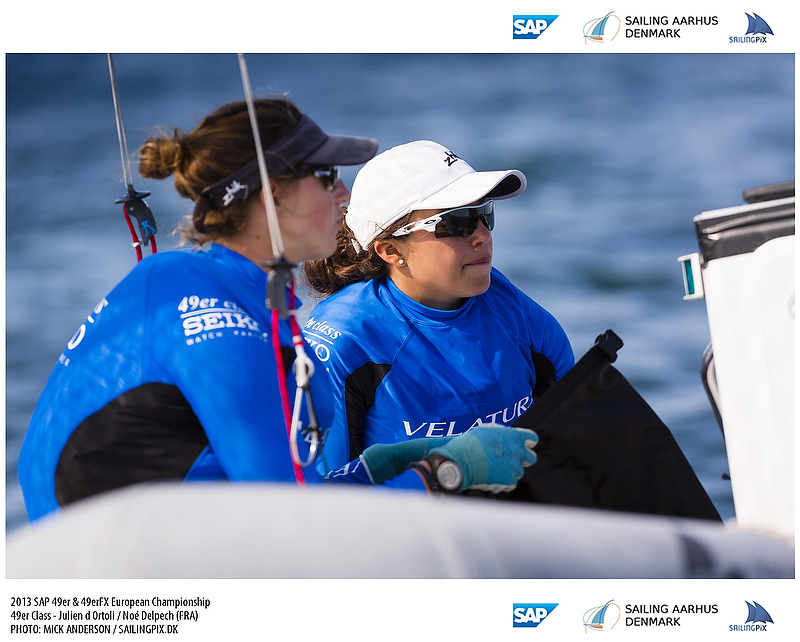 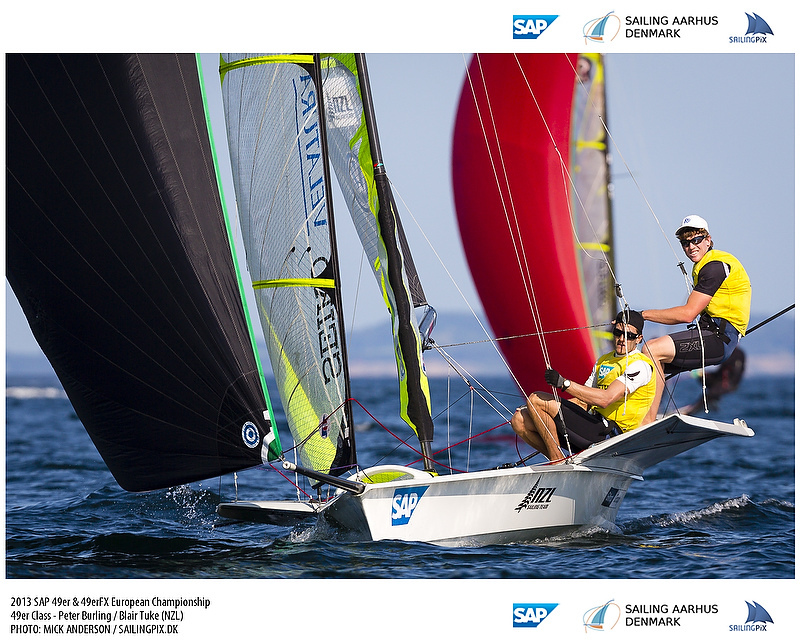 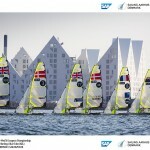 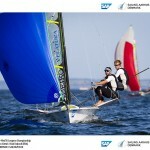 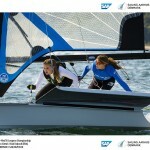 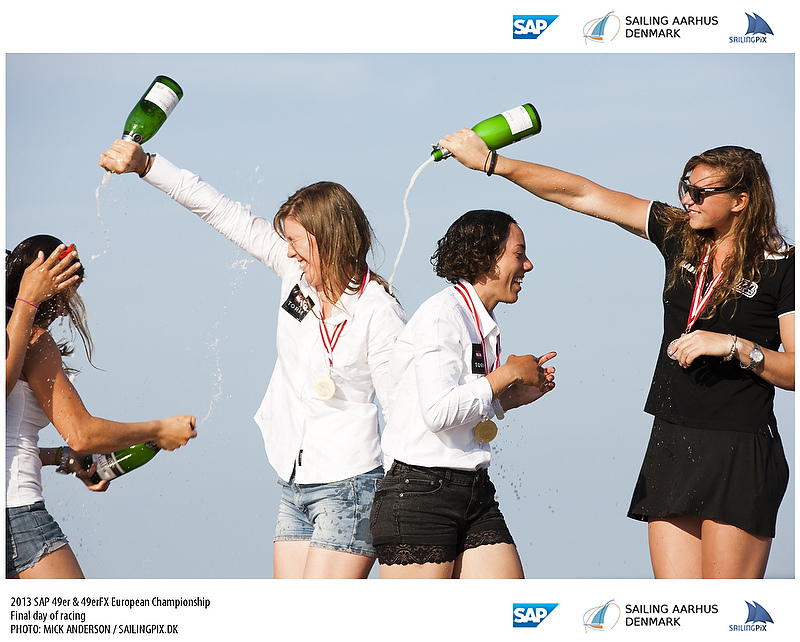 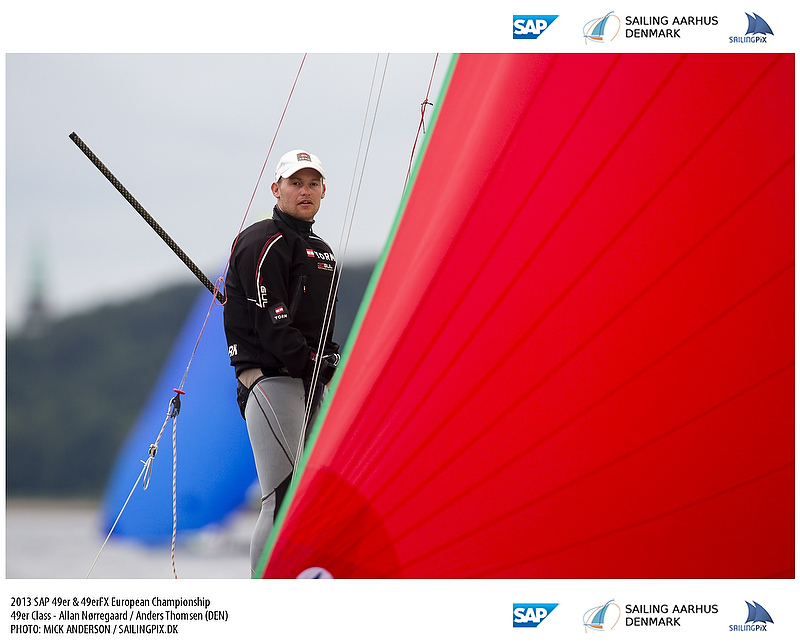 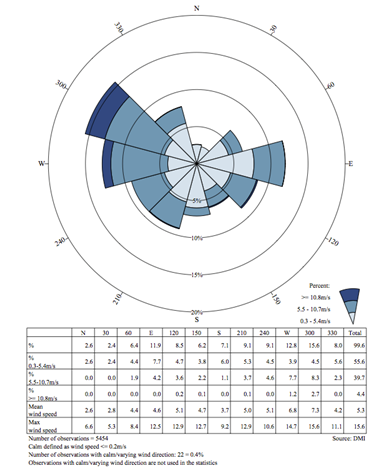 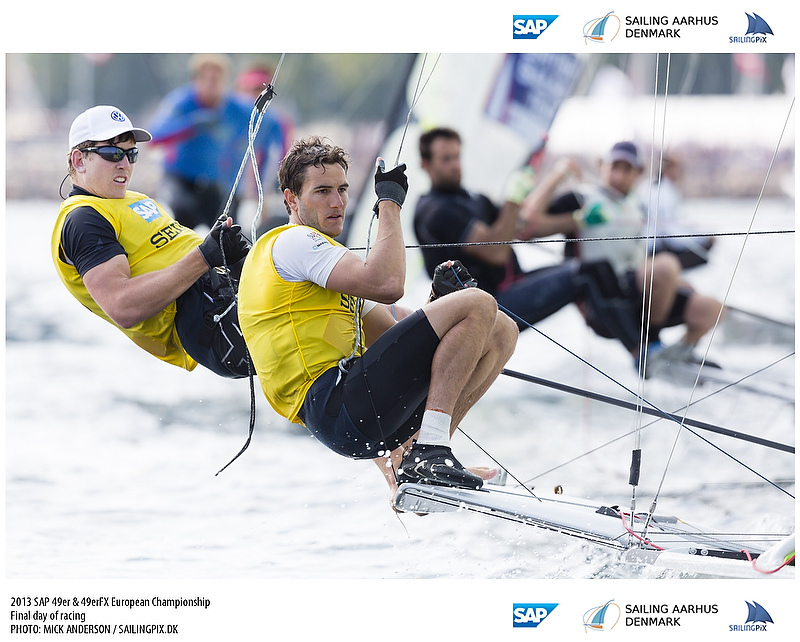 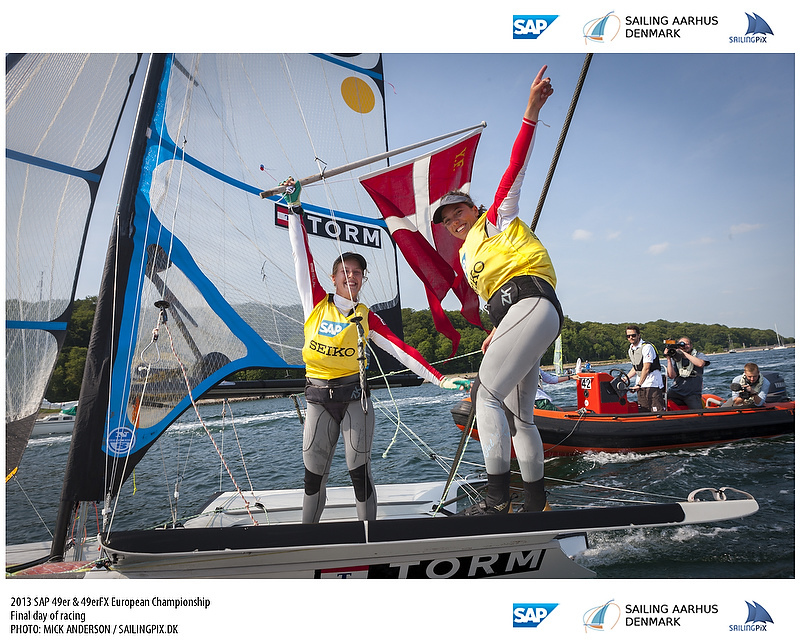 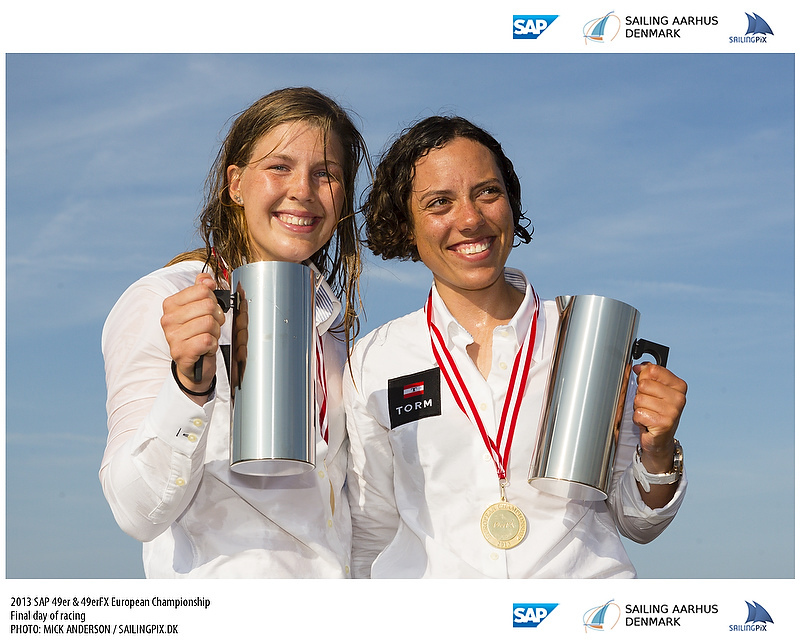 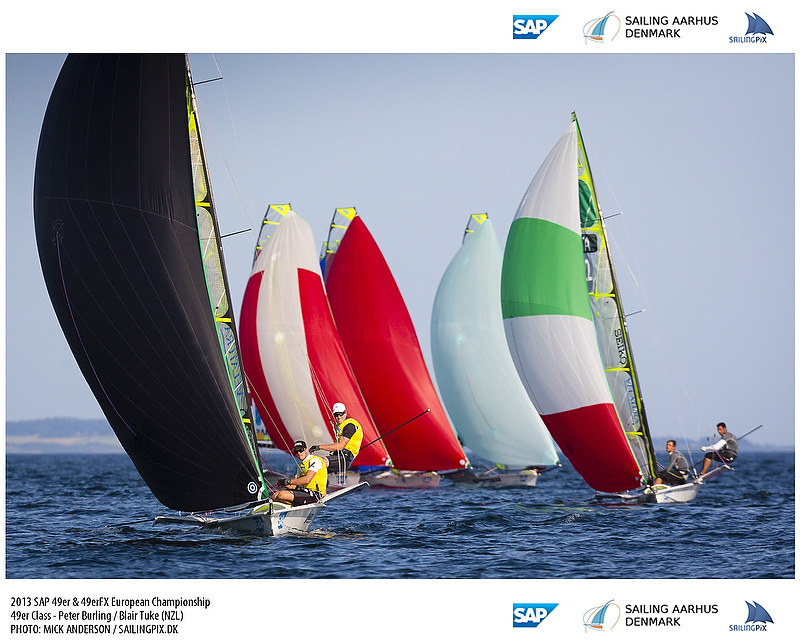 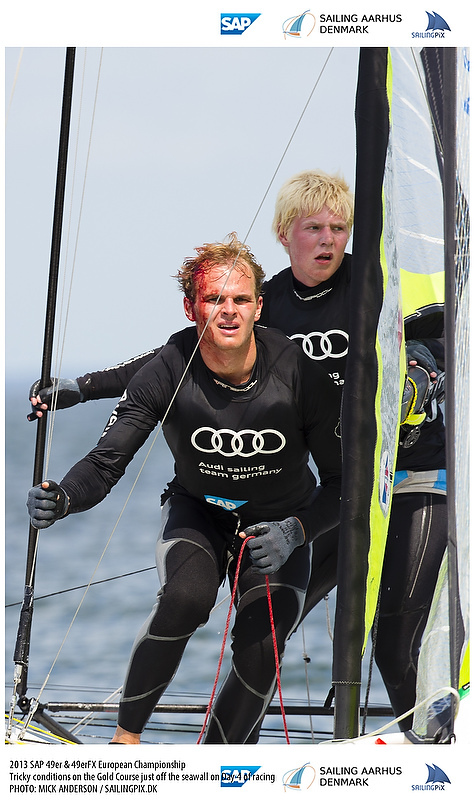 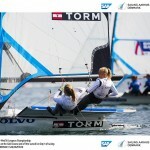 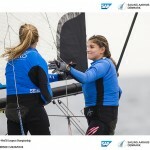 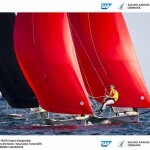 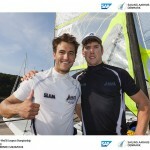 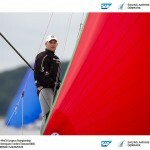 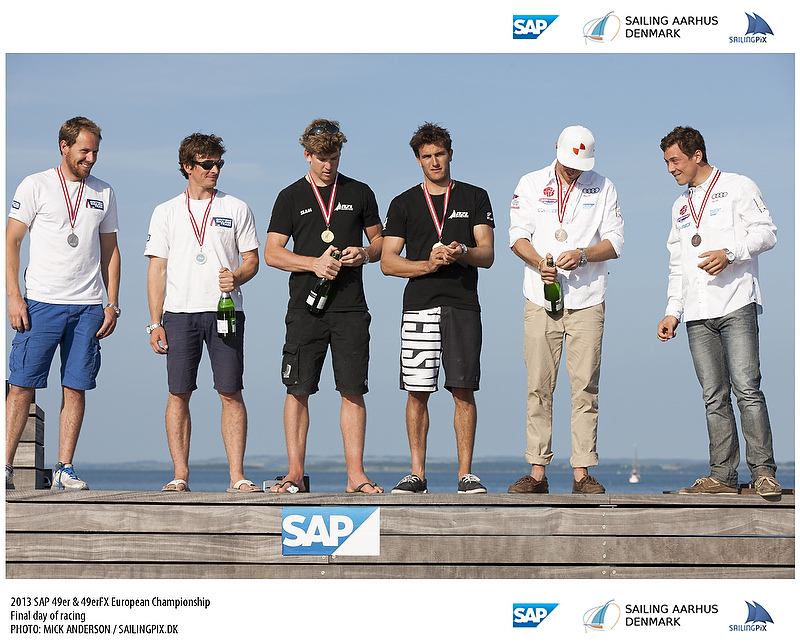 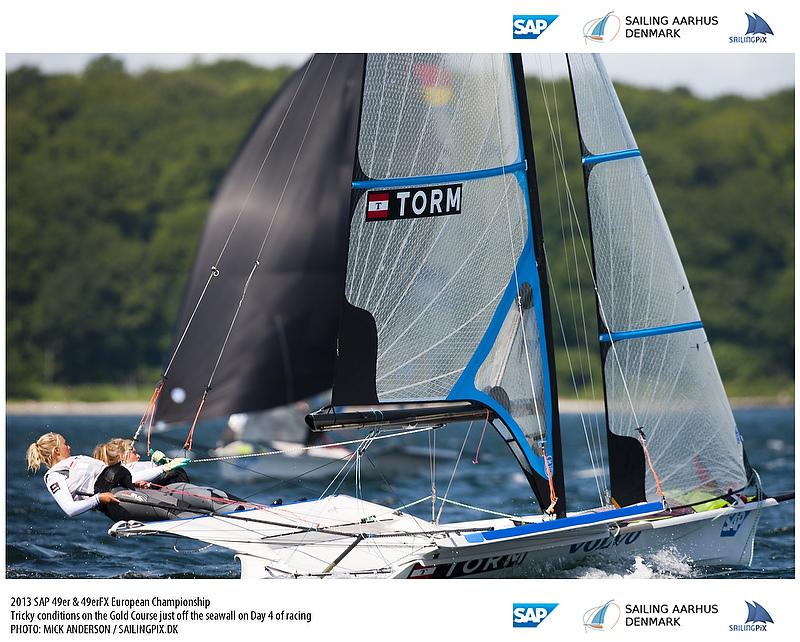 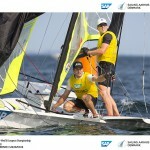 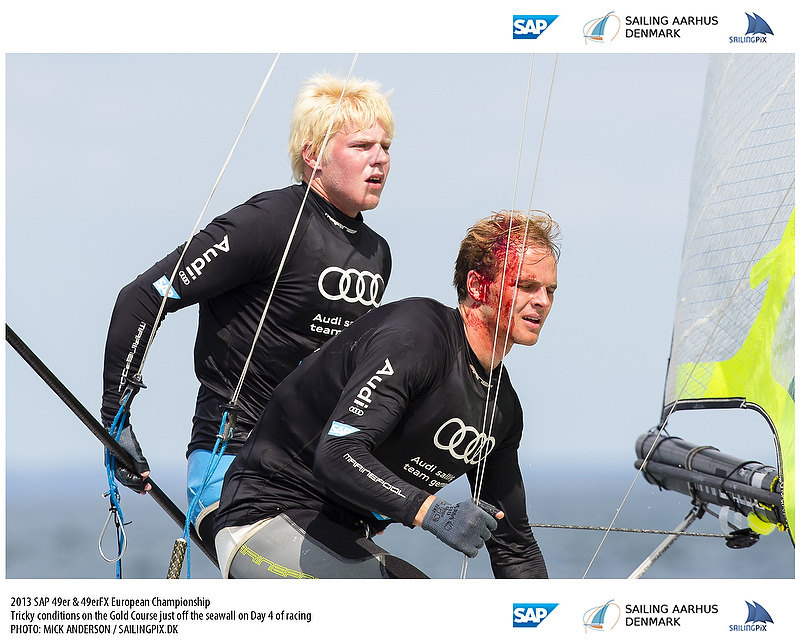 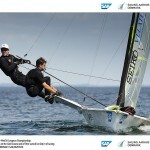 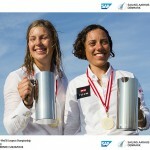 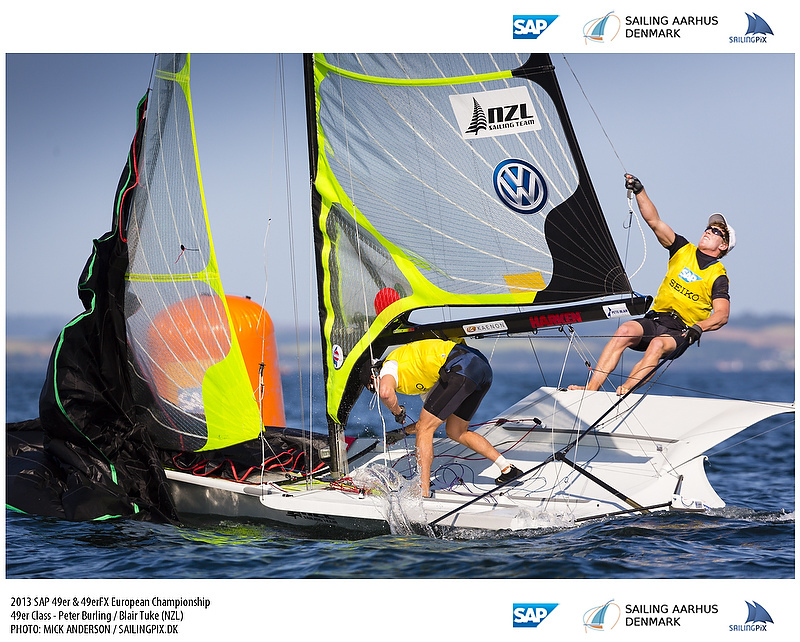 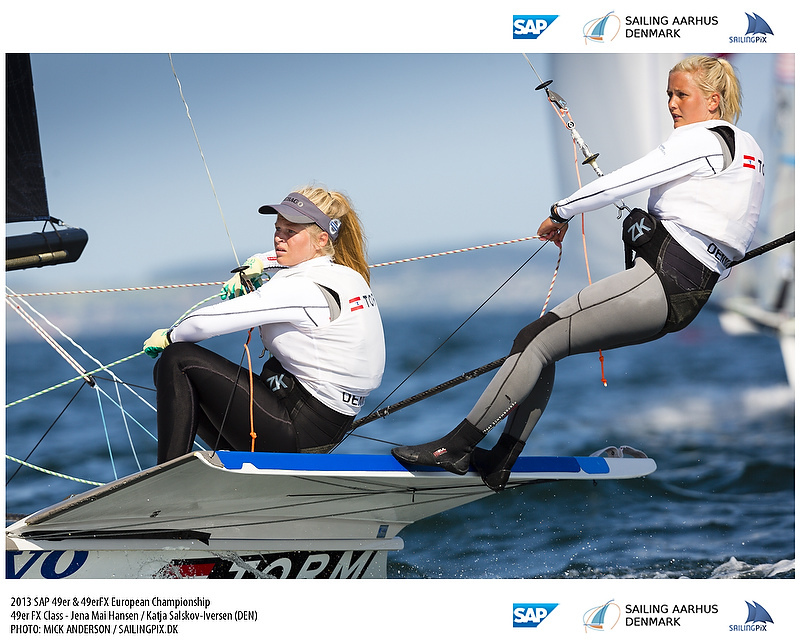 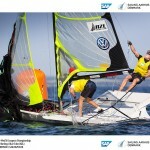 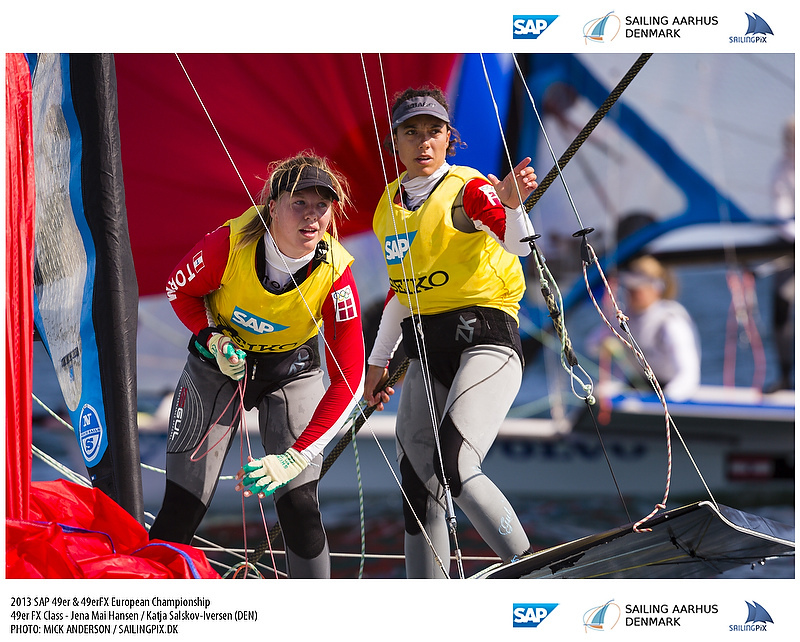 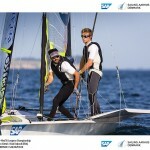 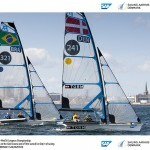 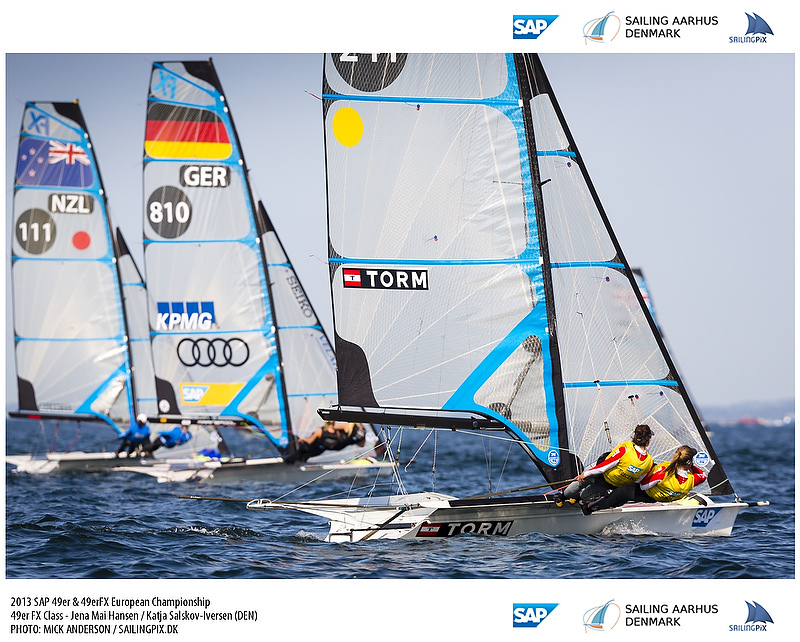 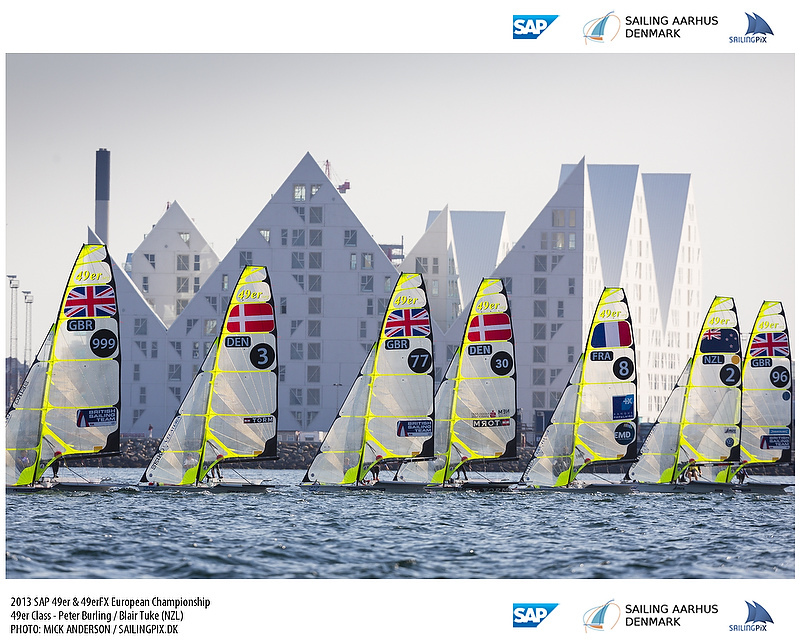 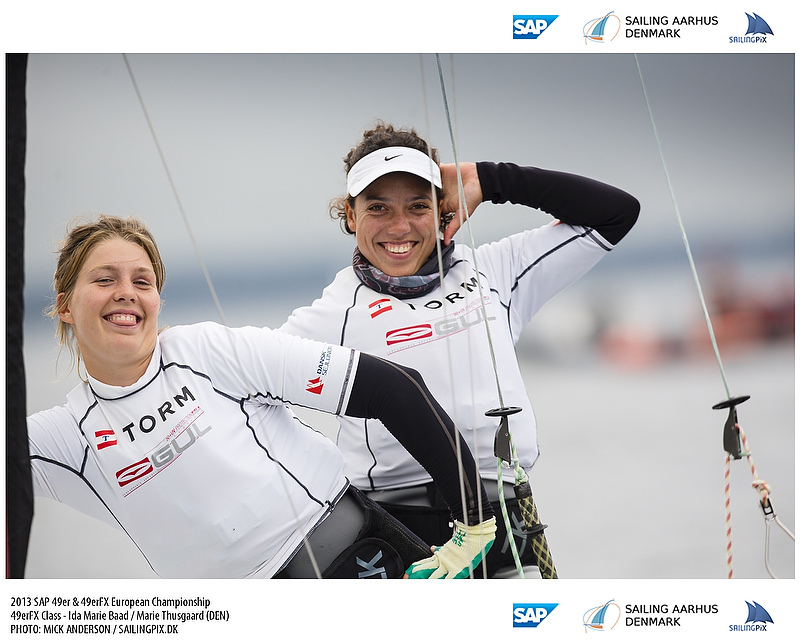 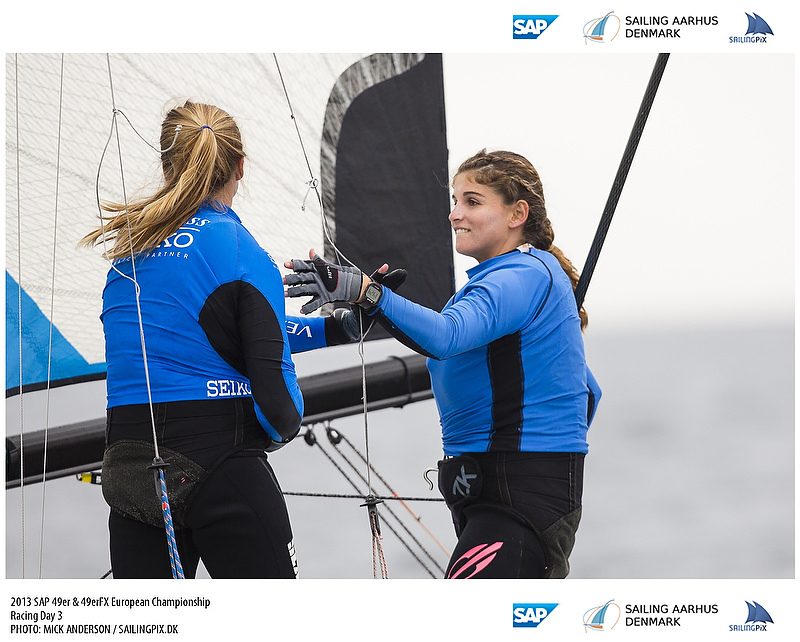 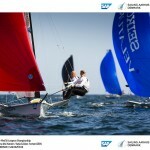 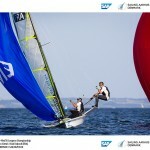 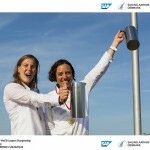 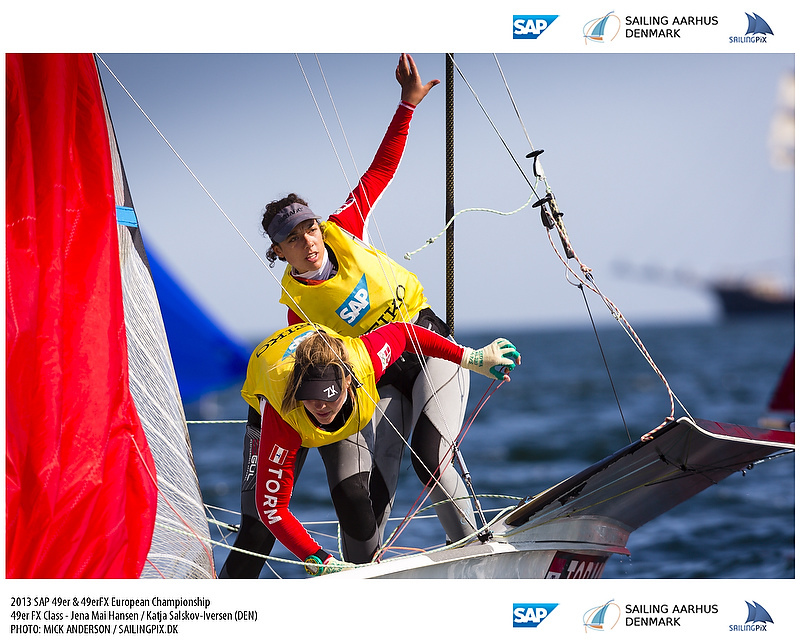 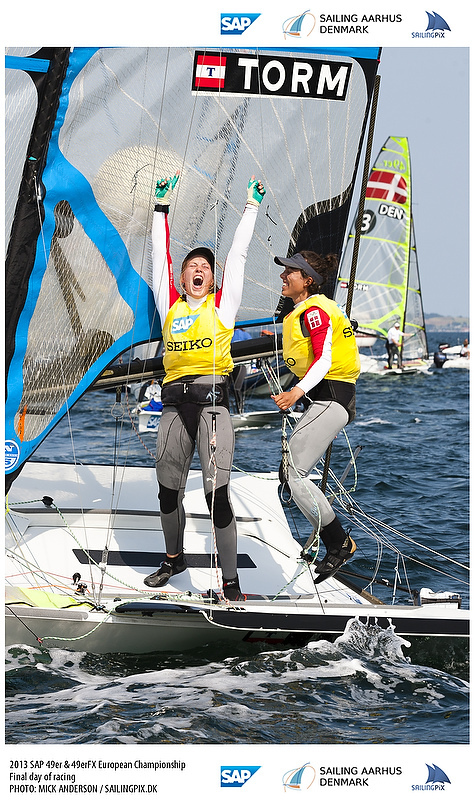 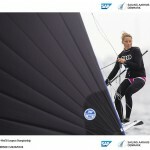 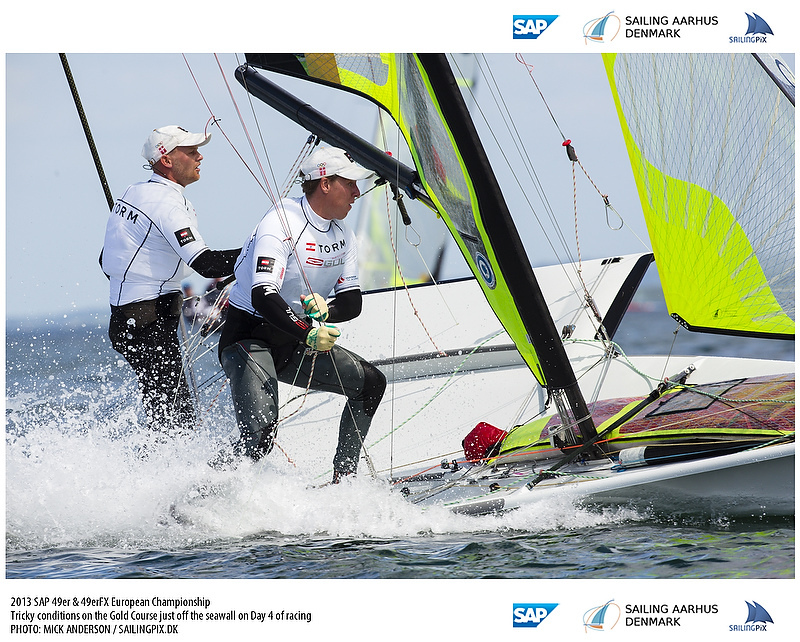 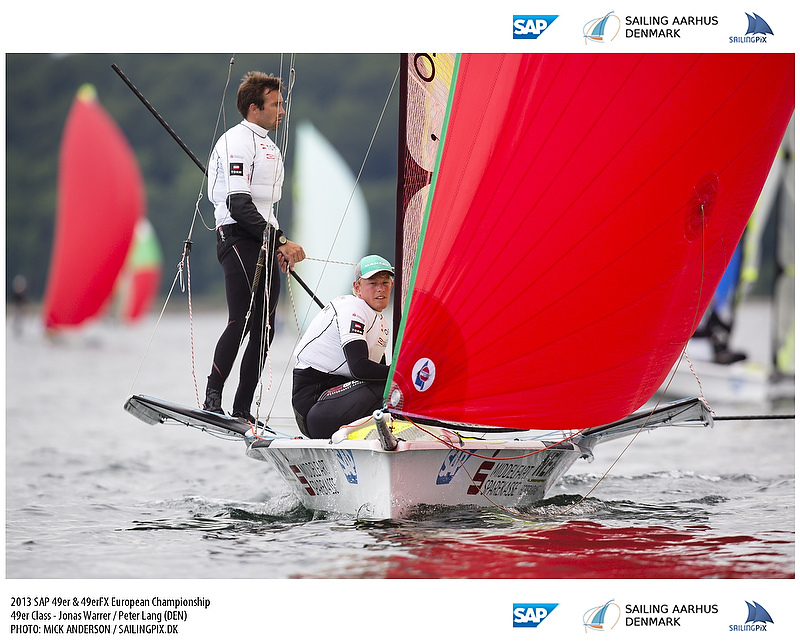 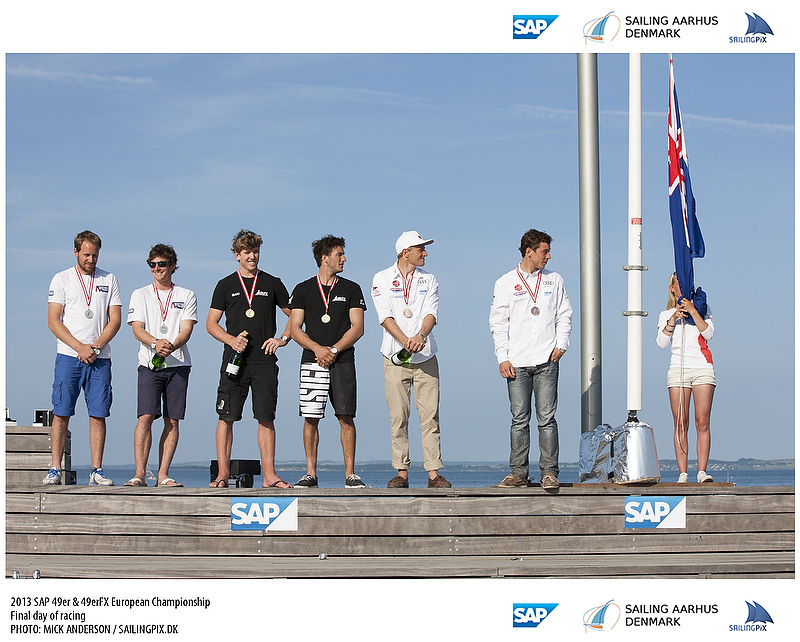 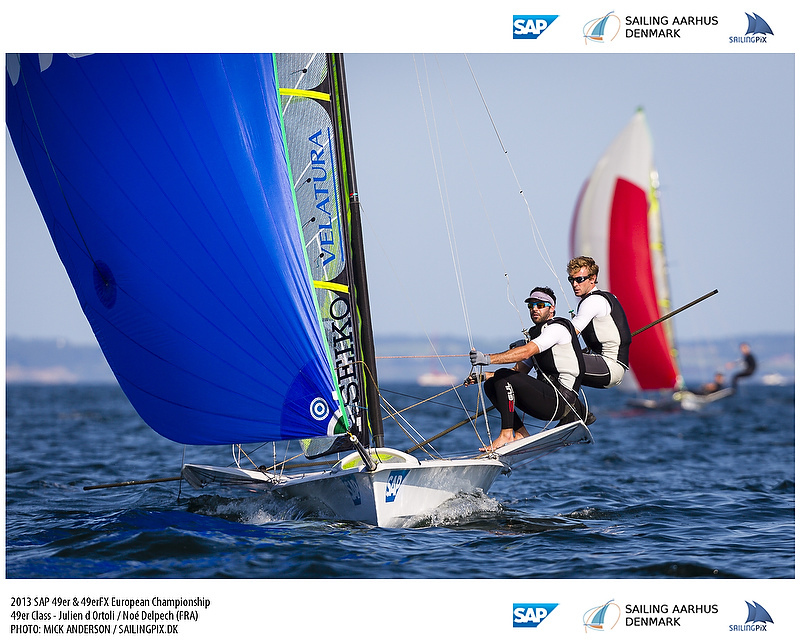 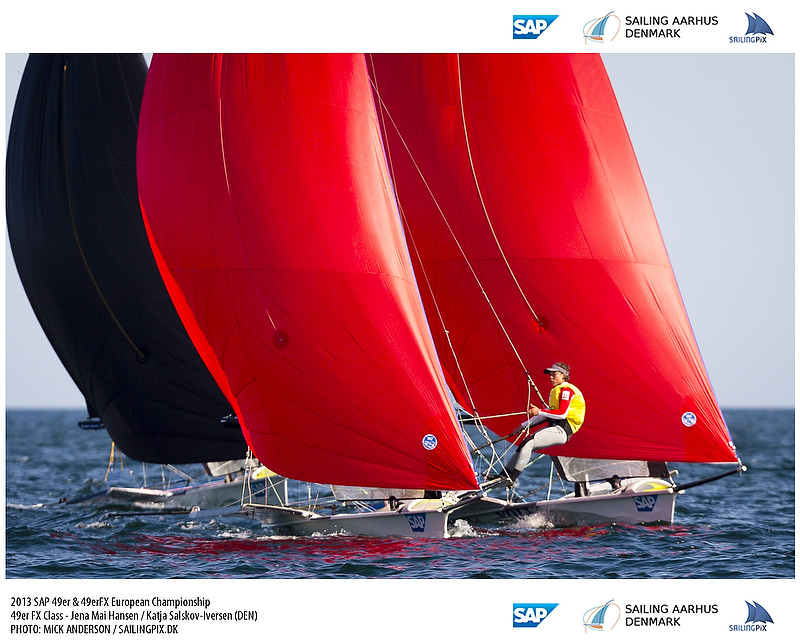 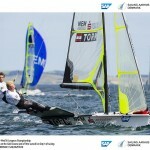 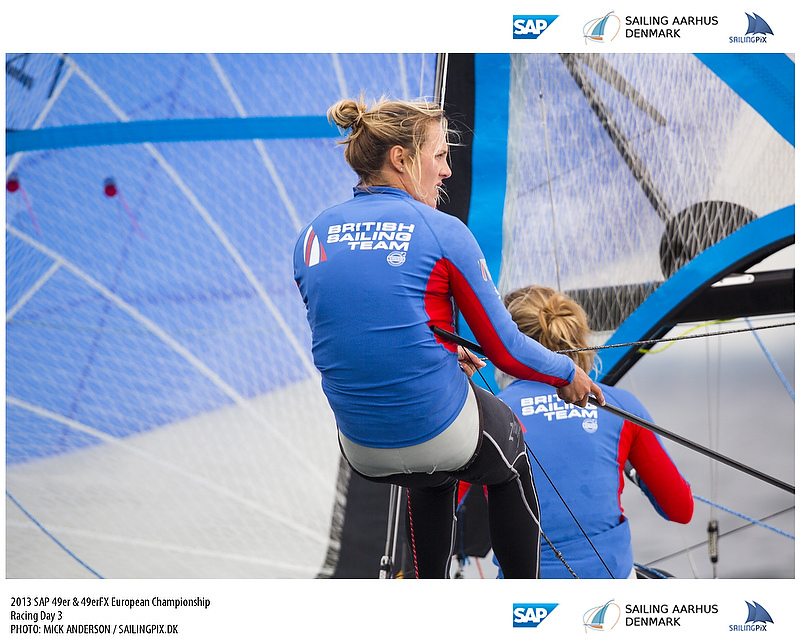 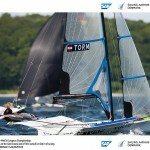 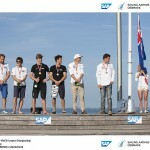 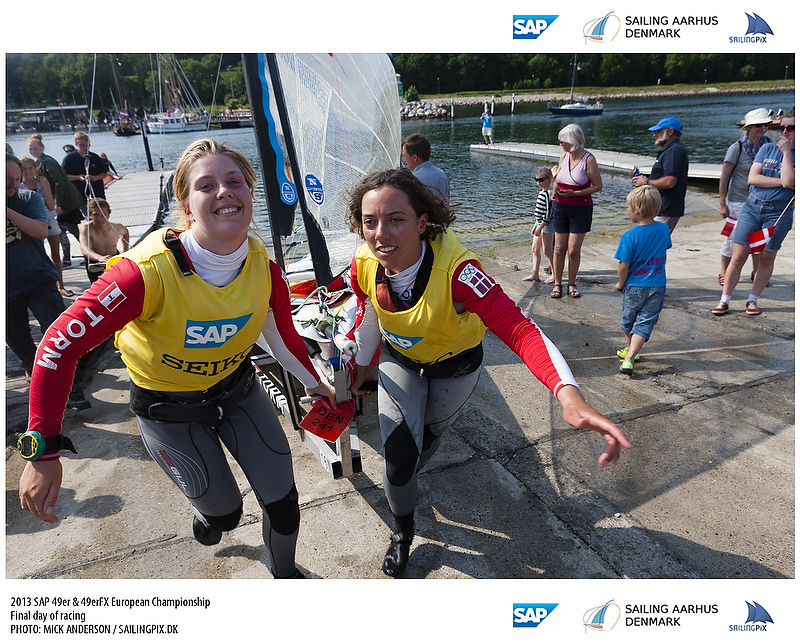 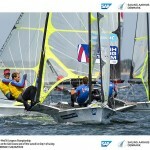 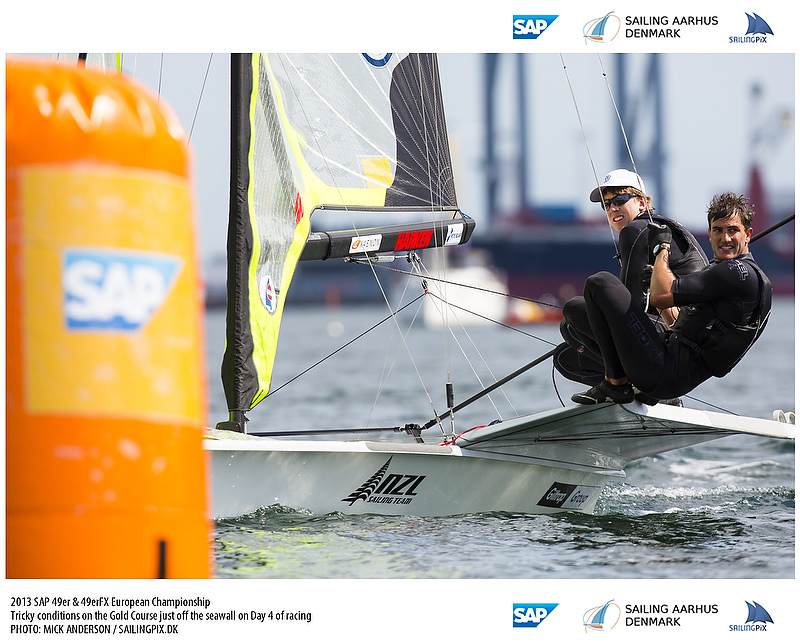 Title sponsor and technology partner SAP have added a new dimension to the 49er & 49erFX Europeans 2013 with analysis of race starts and how a team’s success on the start line converts to a strong finishing position. 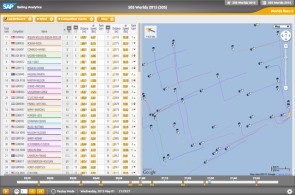 The 49er Class with Magic Marine are using these analytics, and so a points scoring format rewards teams who are the first to round the windward mark, have a short distance to the line at the start, win the pin end or race committee end of the start, have a clear lane one minute after the start and the best port tack flyer! 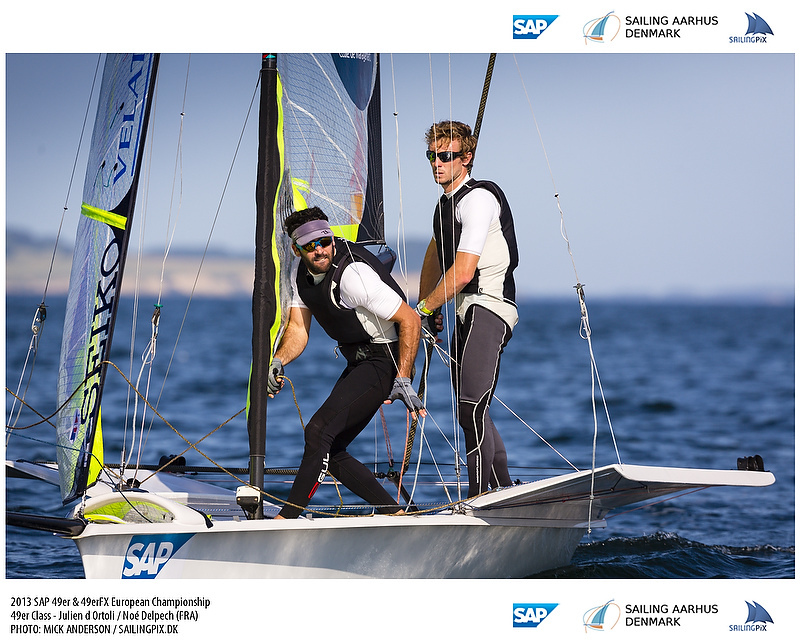 Points will be awarded each day using the SAP analytics system with the winners taking the green and purple jerseys for the next day’s racing. 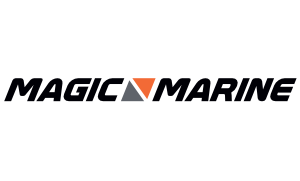 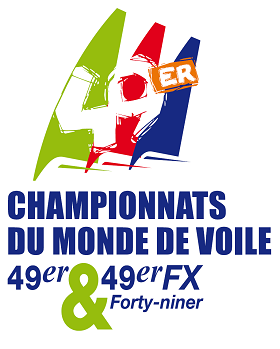 In the 49erFX fleet, the winner today of the “Magic Marine Starting Points Challenge” is Frances Peters and Nicola Groves of Great Britain who will wear the green jerseys tomorrow. 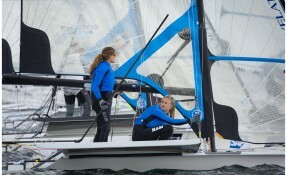 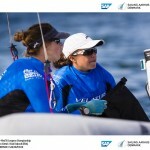 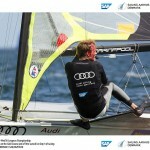 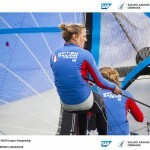 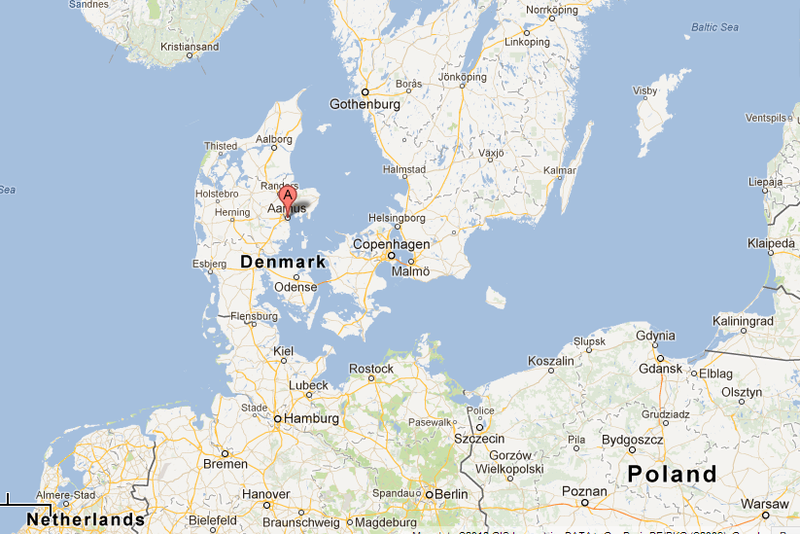 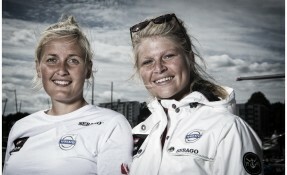 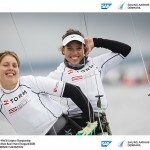 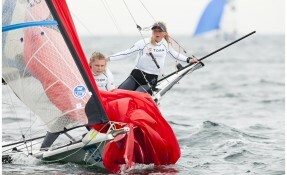 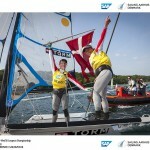 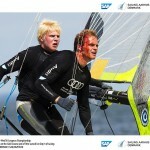 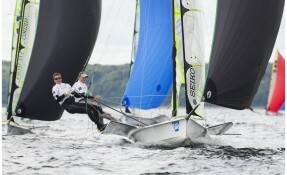 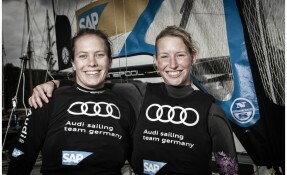 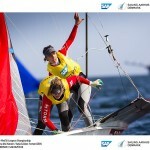 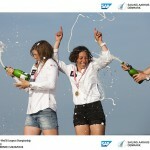 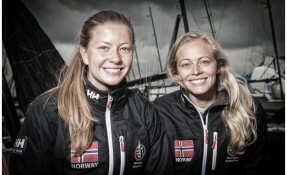 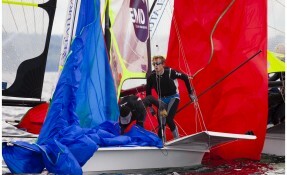 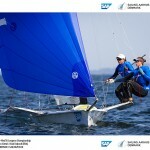 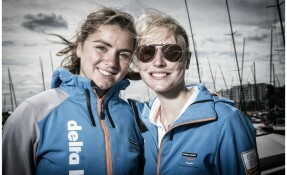 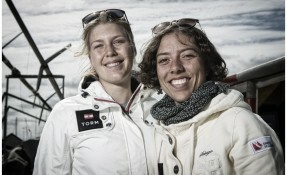 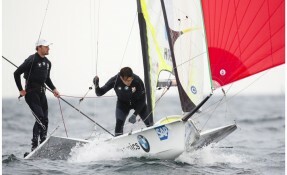 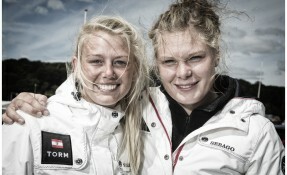 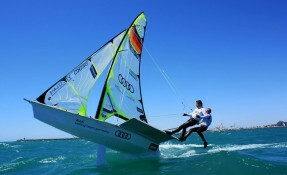 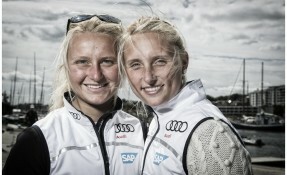 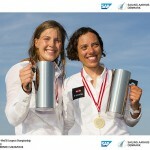 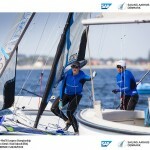 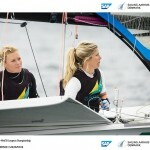 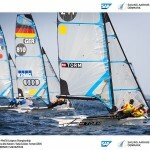 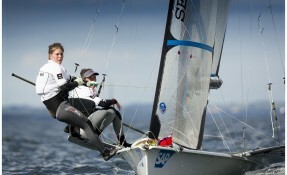 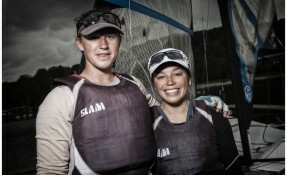 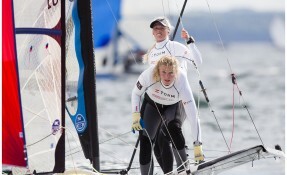 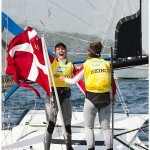 And purple jerseys will be on the backs of Tina Lutz and Susann Beucke of Germany who are the “Queen of the Downwind”. 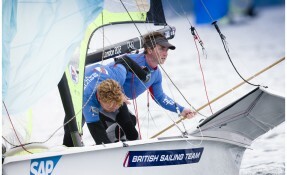 An all British dominance in the 49er fleet, with David Evans and Edward Powys leading the “Magic Marine Starting Points Challenge” to own the green jerseys tomorrow, with the “King of the Downwind” purple jerseys going to James Peters and Ed Fitzgerald.